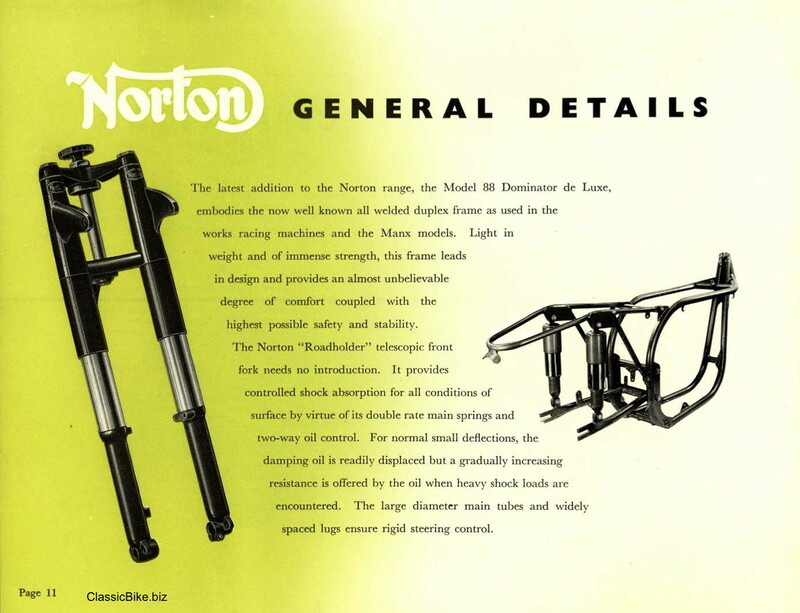 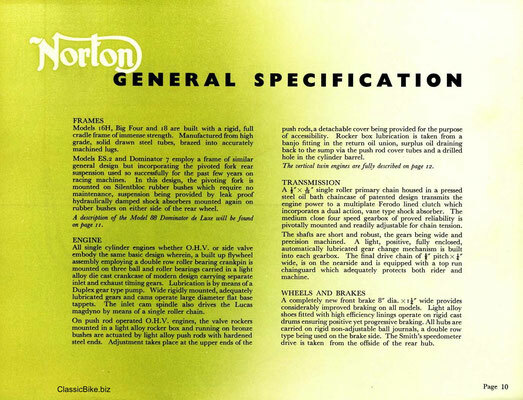 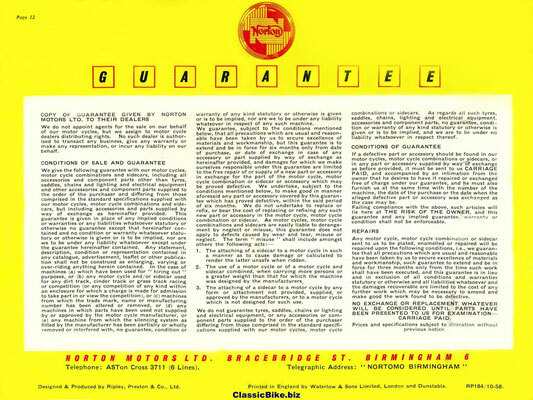 1898 Company founded by James Lansdowne Norton, a toolmaker with deeply religious beliefs and very high standards. 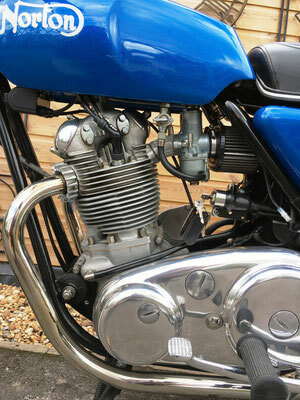 He began with the supply of fittings to the two-wheeled trade. 1902 James Lansdowne Norton built his first motorcycle, powered by an imported Clement engine which hung from the bicycle frame downtube. 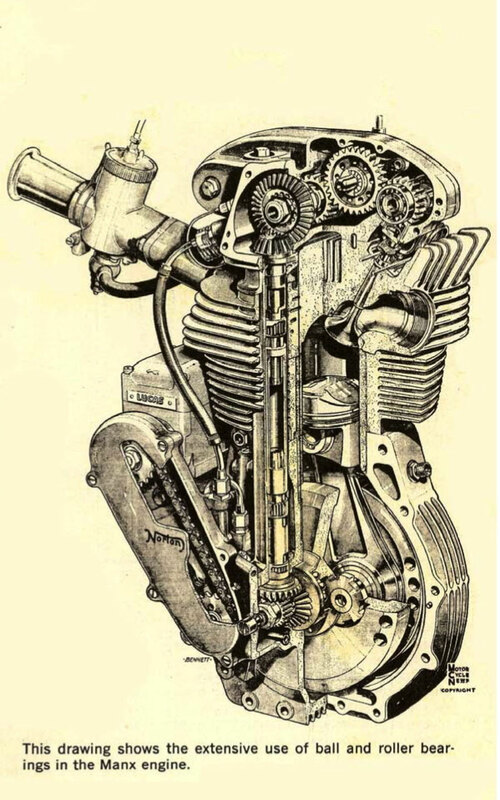 Advanced for the times, the machine was called the Energette, with either direct belt or chain transmission and two-speed gearbox. 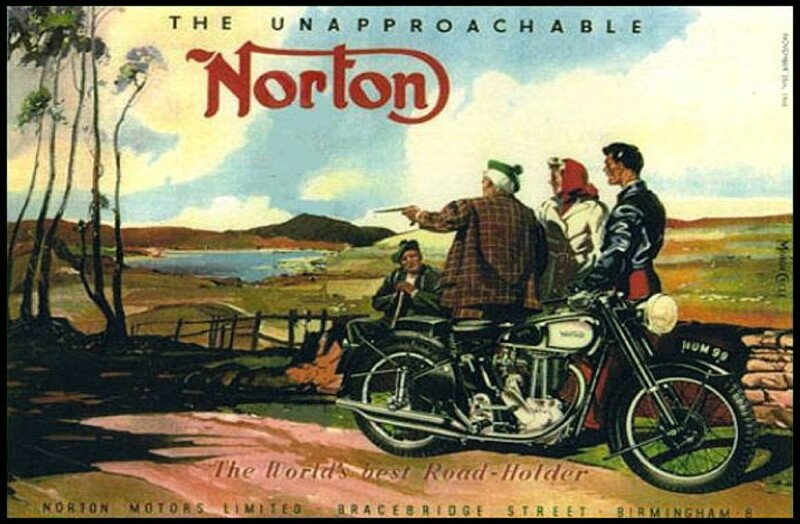 1902-1903 Early Norton machines were first advertised under the name of Energette. 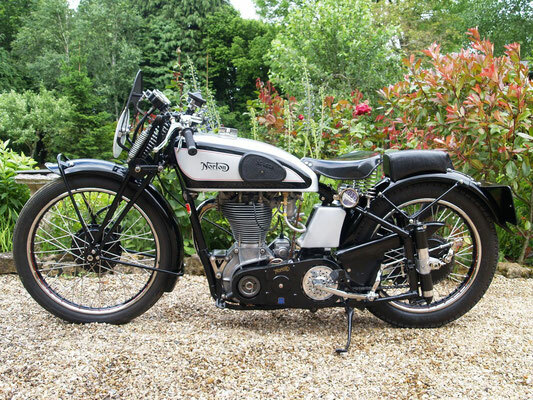 They were powered by 160cc French Clement engines and had either direct-belt drive or chain to a two-speed gearbox, and final belt-drive. 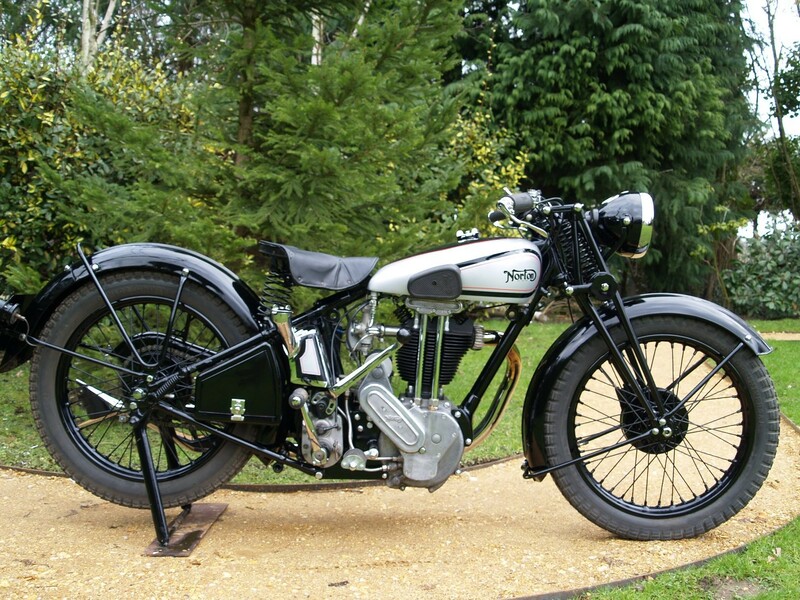 1903 More machines were developed using mainly Peugeot engines. 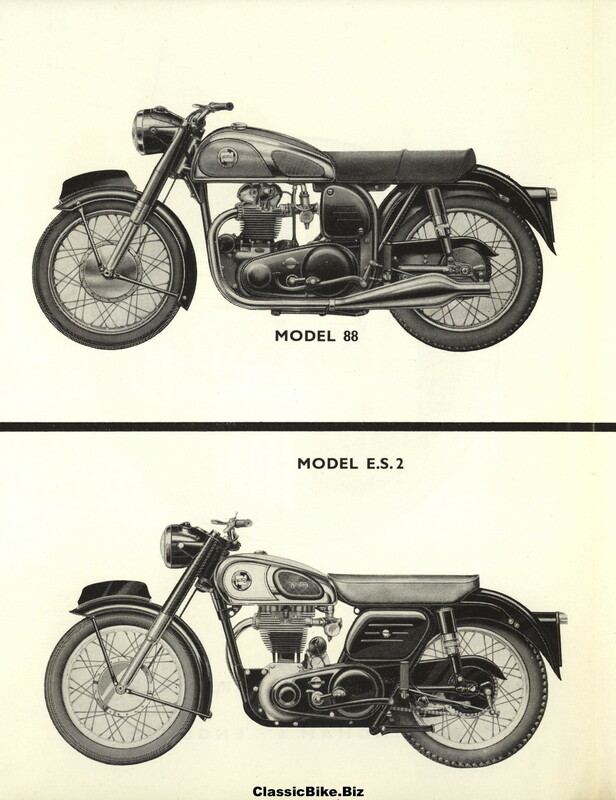 1907 The name Energette was revived for another model. 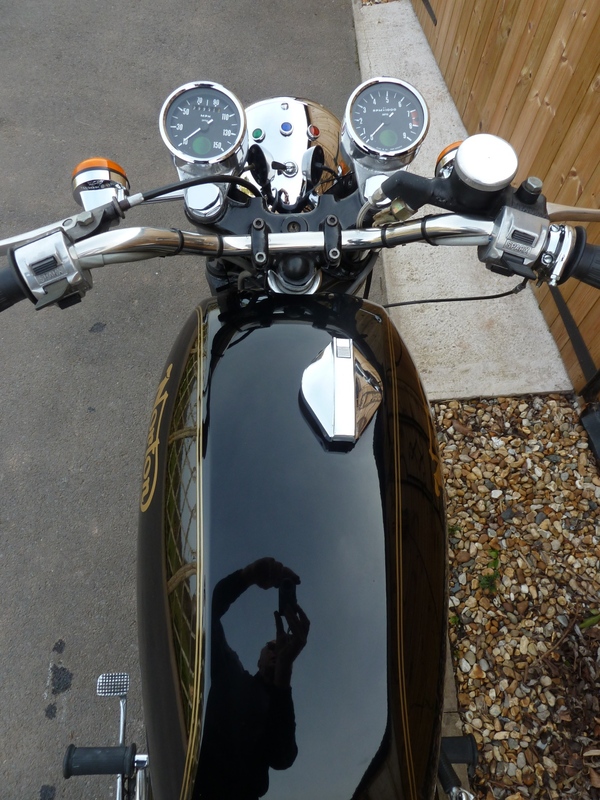 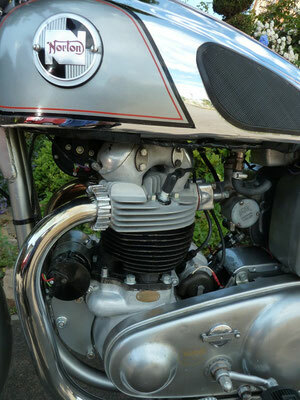 This was powered by a V-twin 374cc Moto Rêve engine. 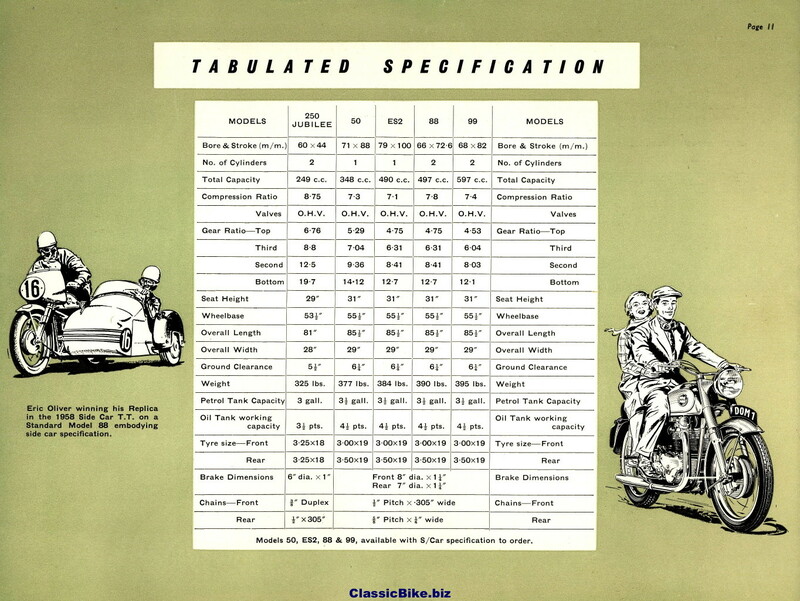 The complete machine only weighed 76lb. 1908 Launched the Nortonette. 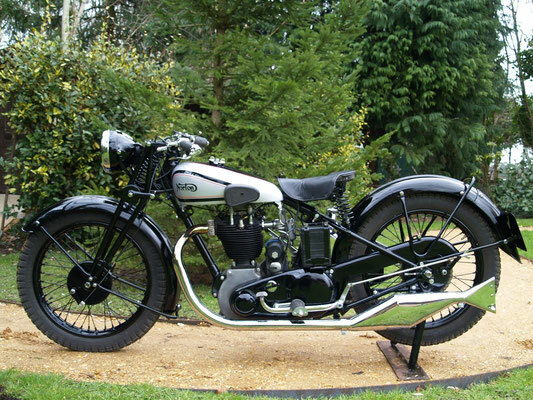 This had a 2hp single-cylinder engine, but was soon dropped. 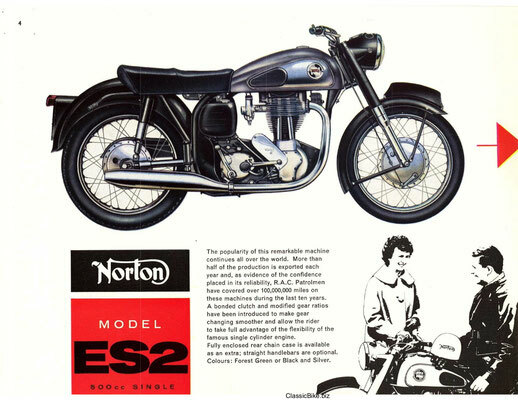 Energette took the Nortonette name, before vanishing from the Norton range. 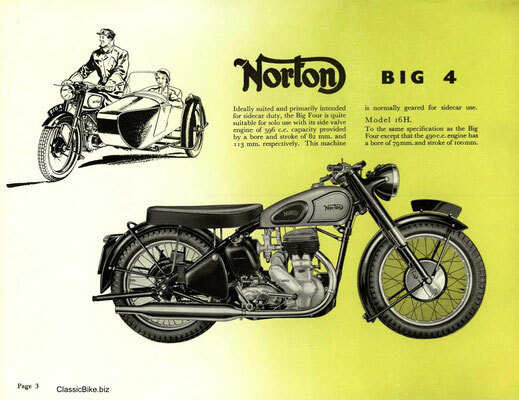 1907/1908 Norton began to design and produce his own engine, a 4bhp 633cc side-valve single called the Big Four. 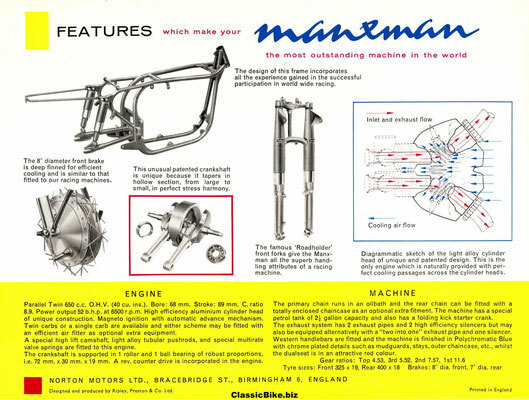 The success of this simple, well-built machine lasted for over four decades. 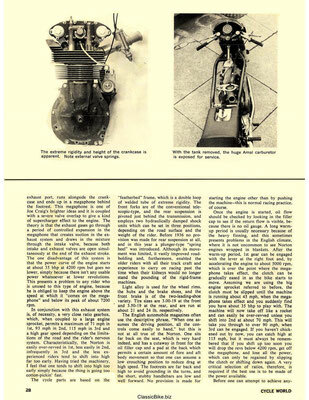 His concentration on engineering and neglect of finances brought trouble. 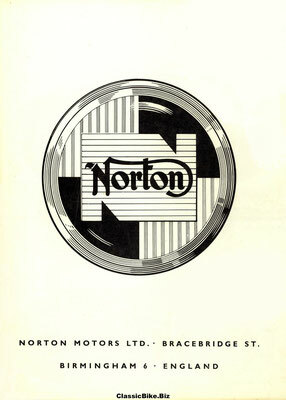 This resulted in a buy-out by R. T. Shelley, who joined Norton as managing director. 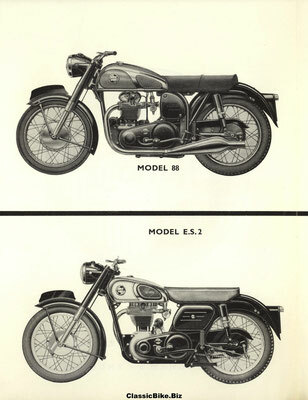 1909, 1910 and 1911. 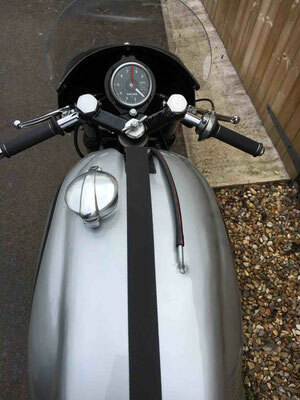 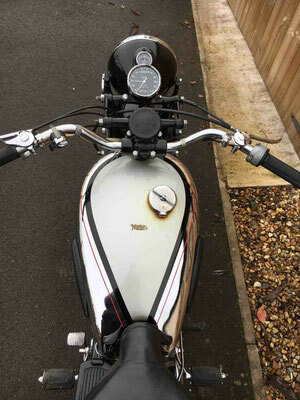 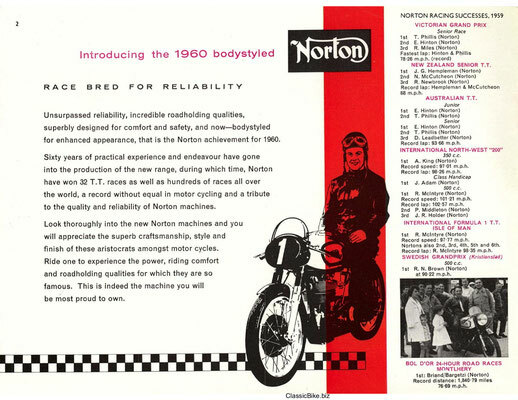 James Norton raced in the TT unsuccessfully, on his new 494cc model. 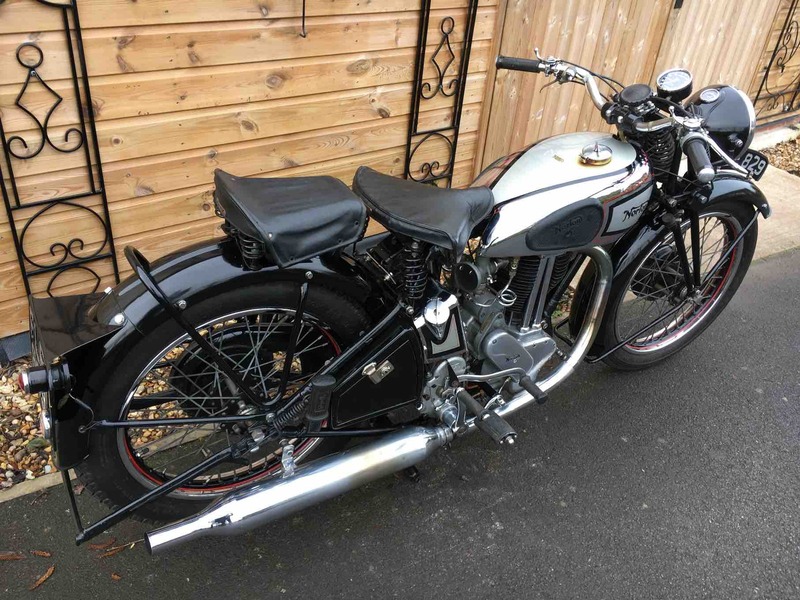 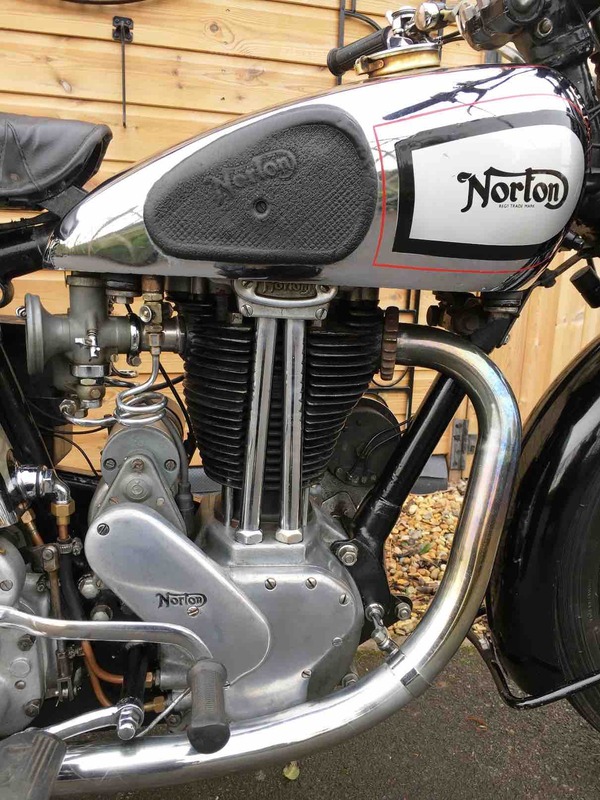 1913 Norton went into liquidation, while its owner recovered from an illness contracted on the Isle of Man. 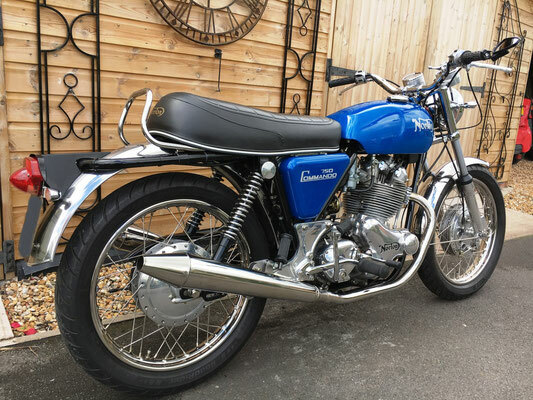 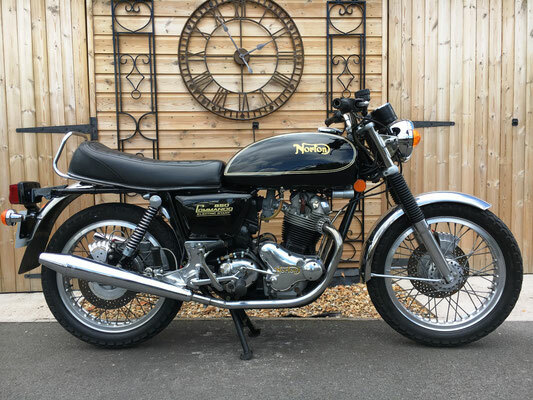 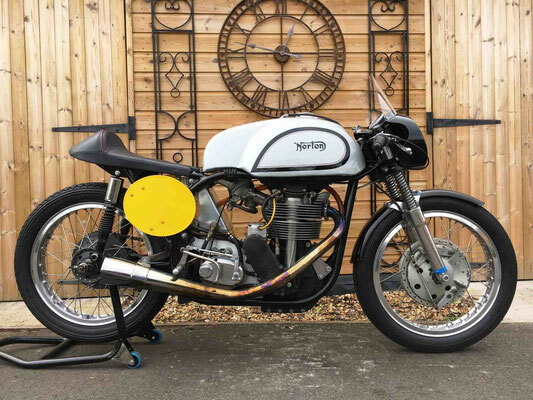 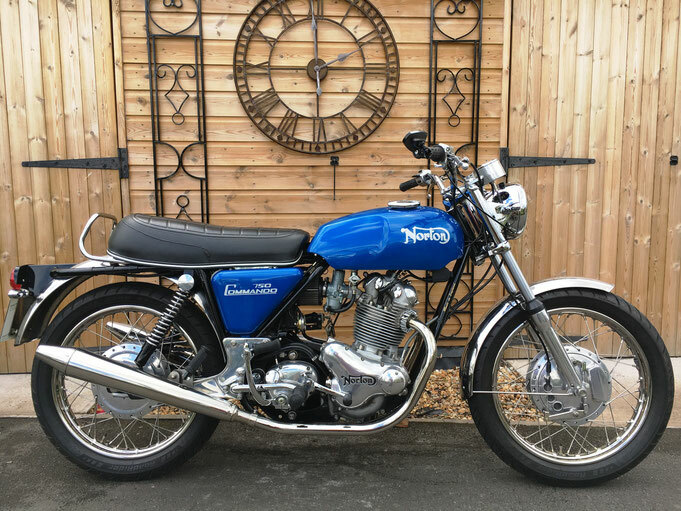 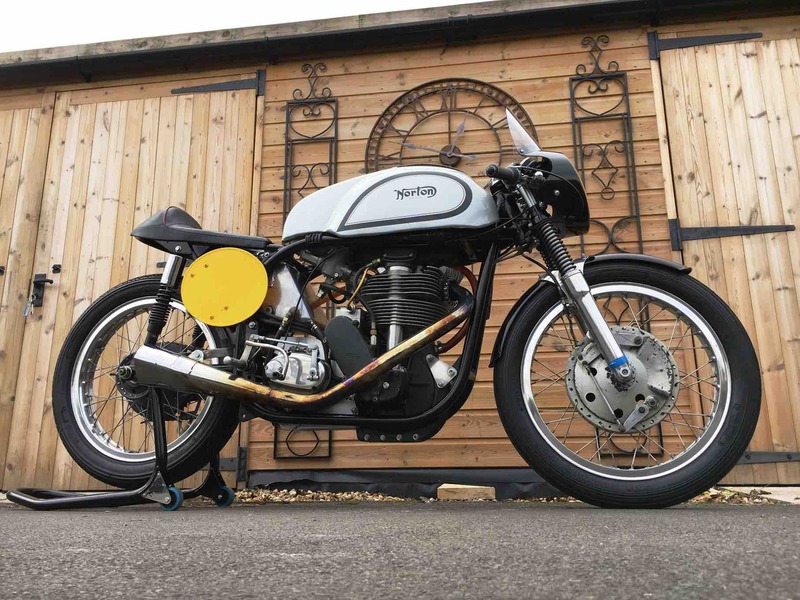 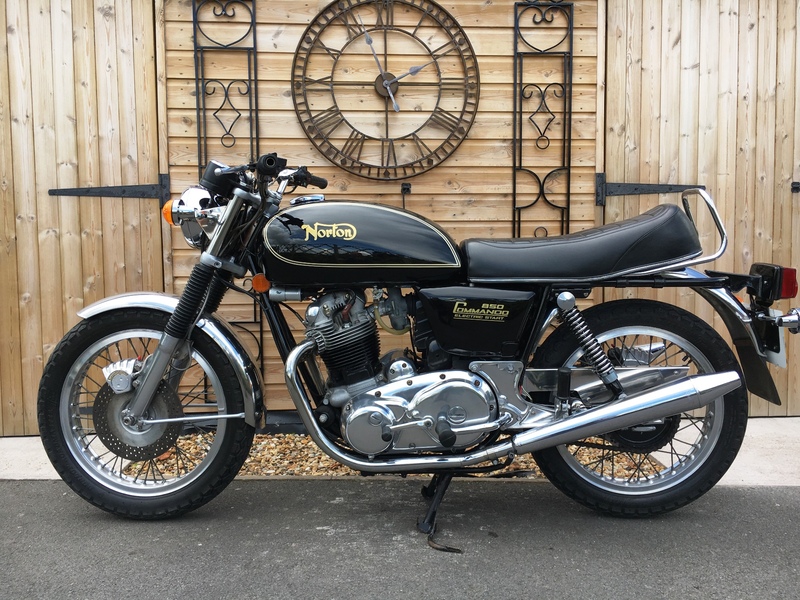 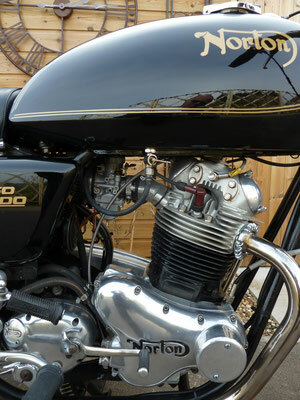 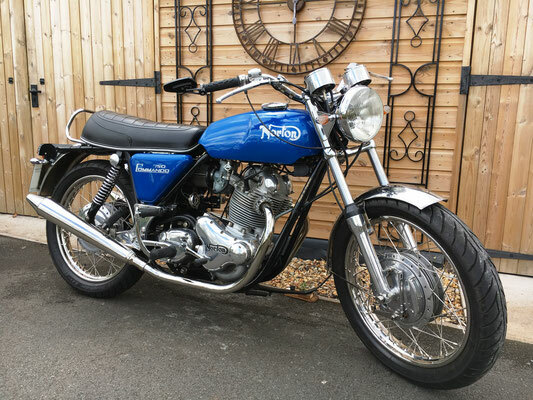 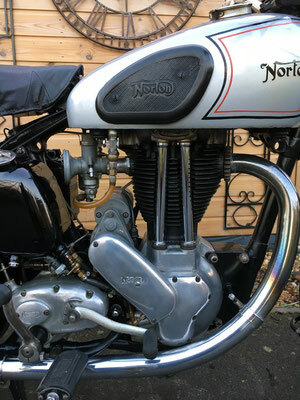 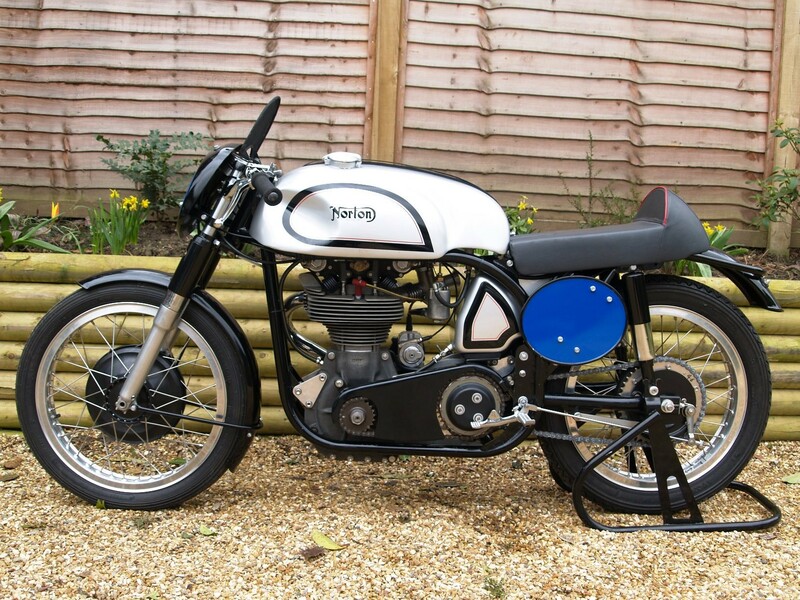 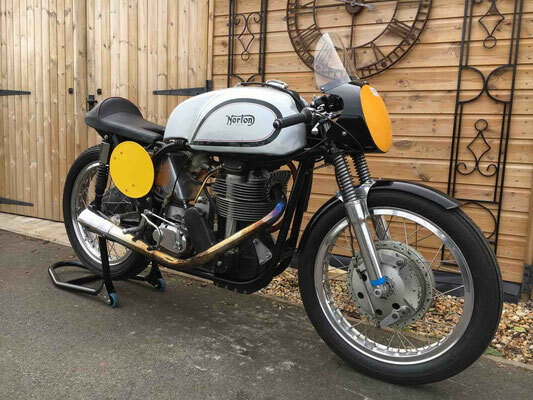 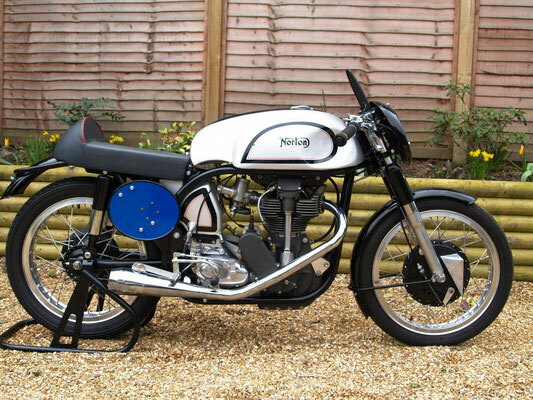 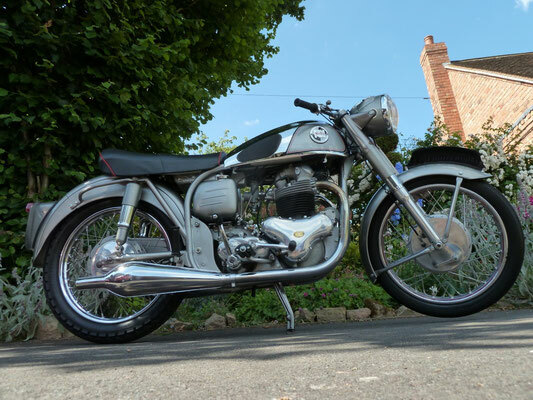 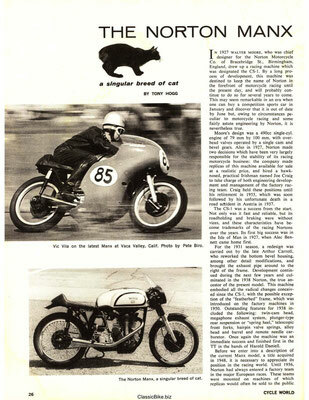 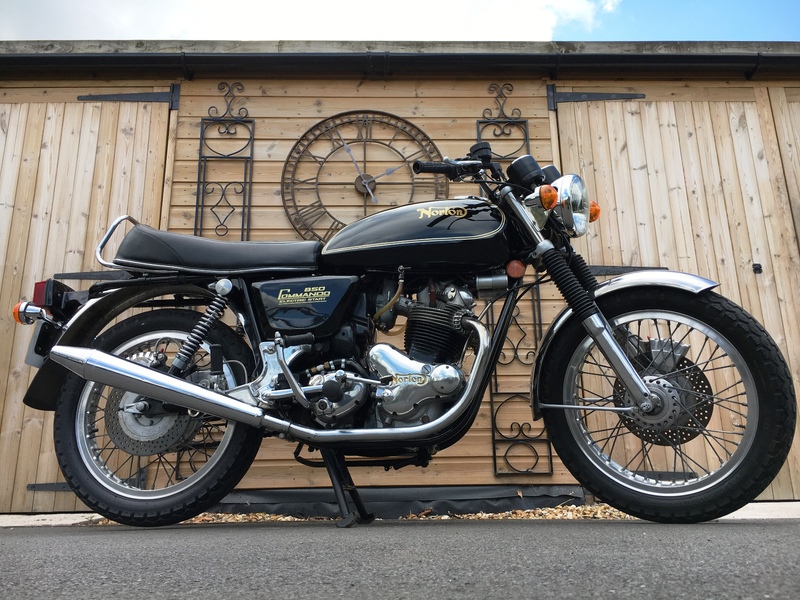 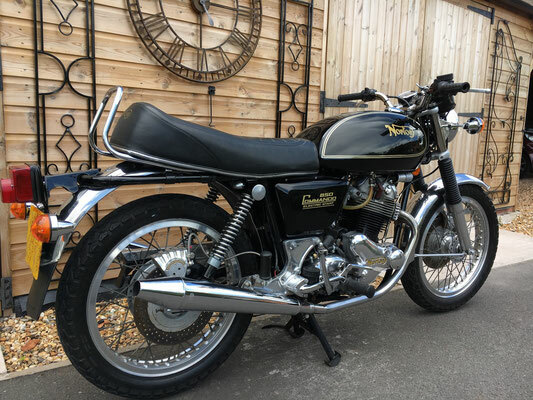 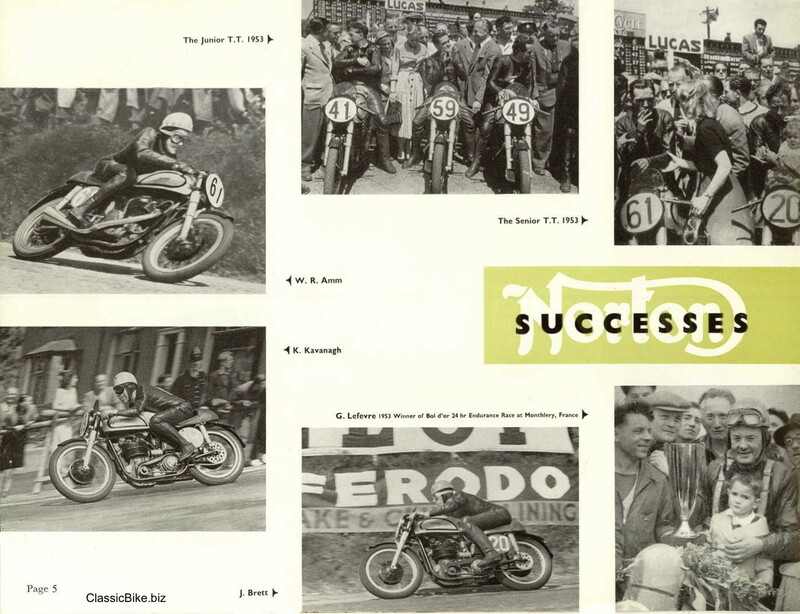 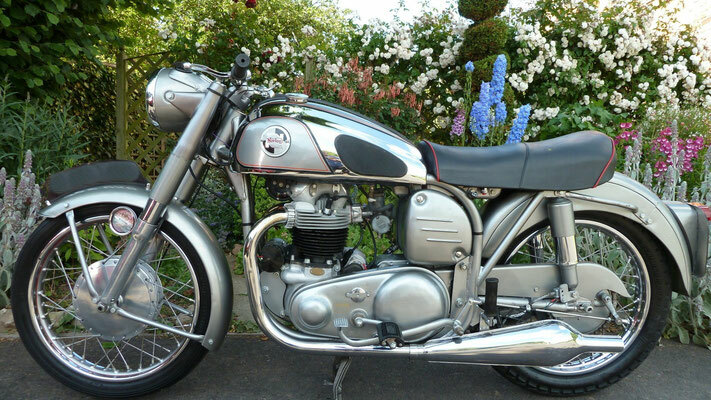 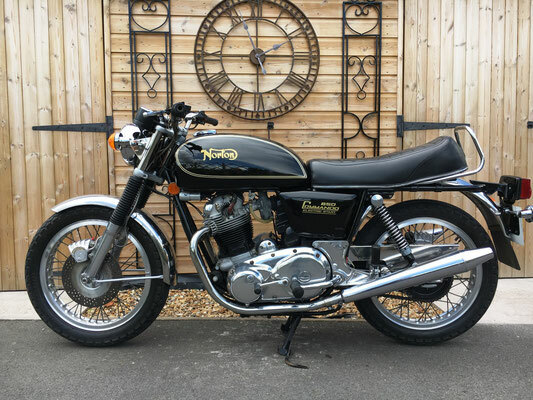 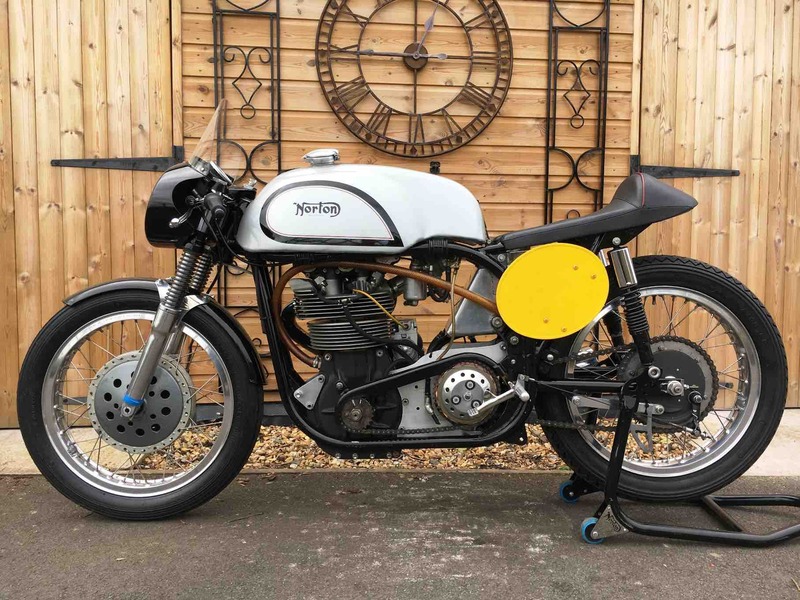 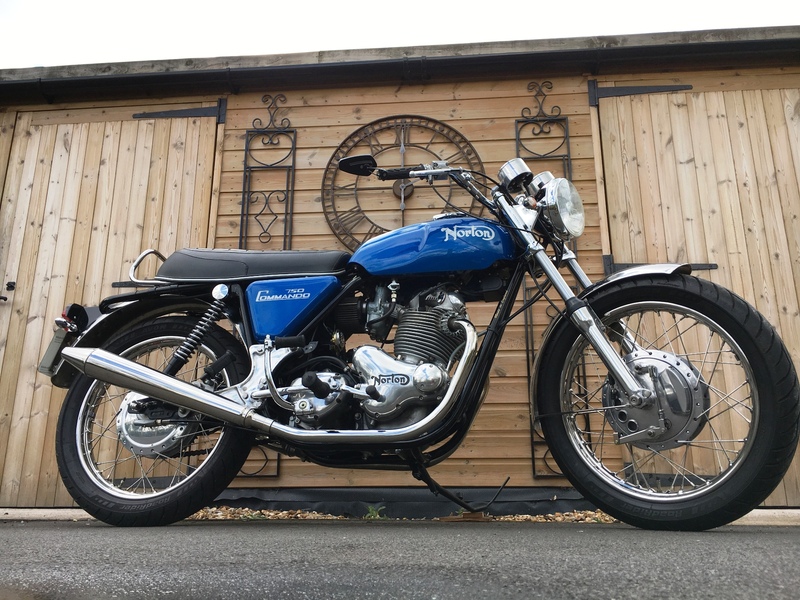 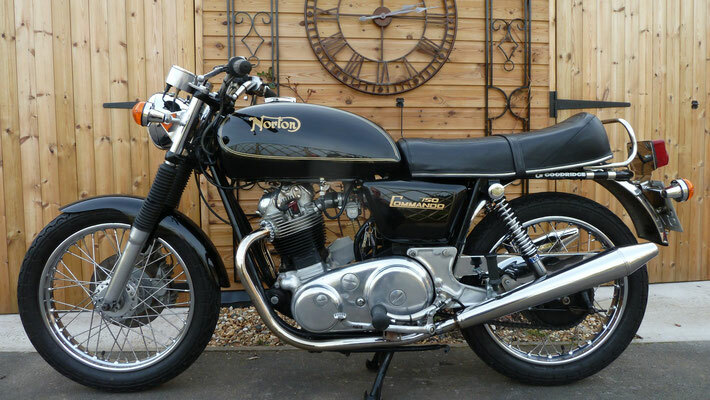 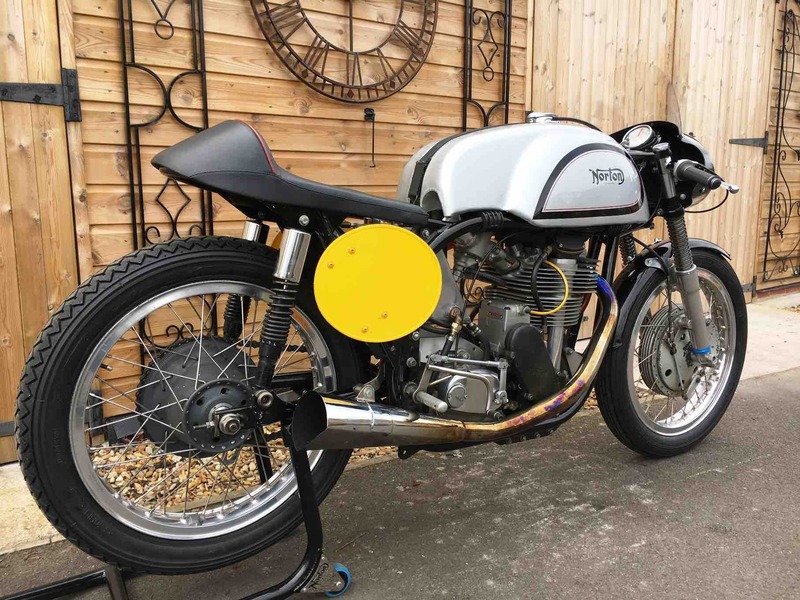 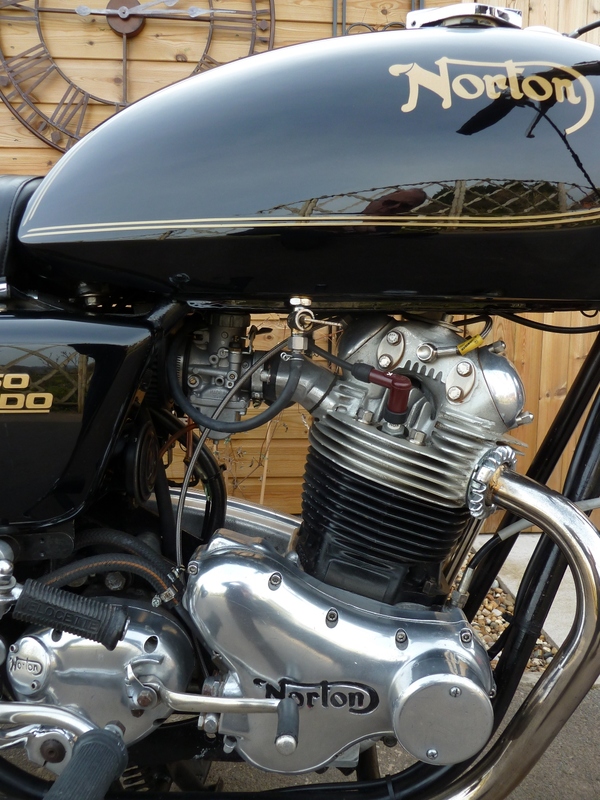 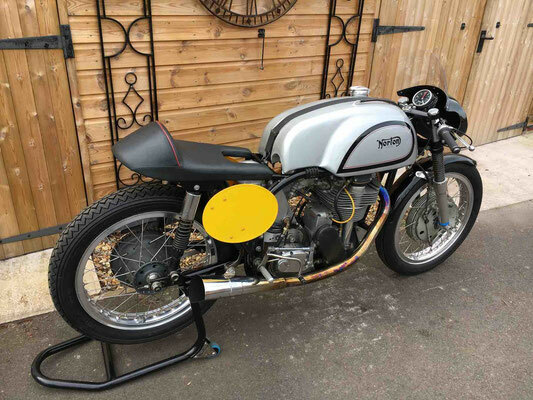 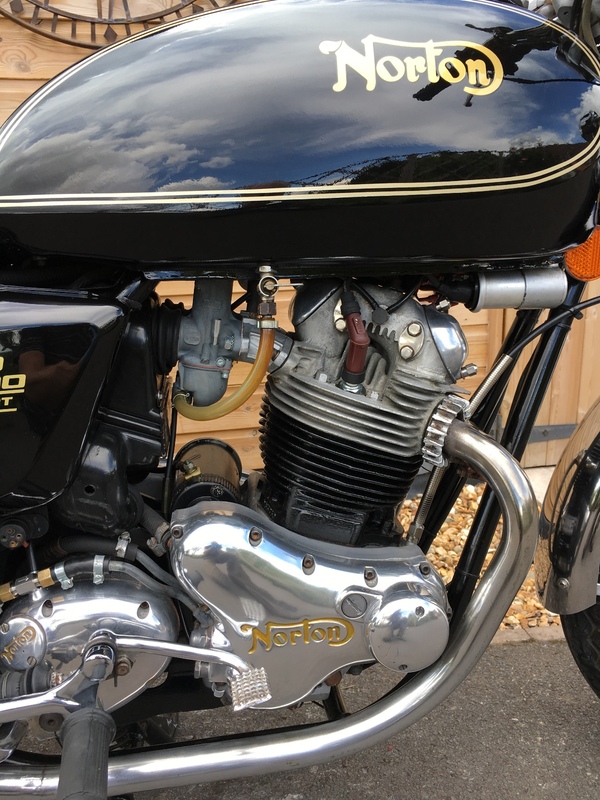 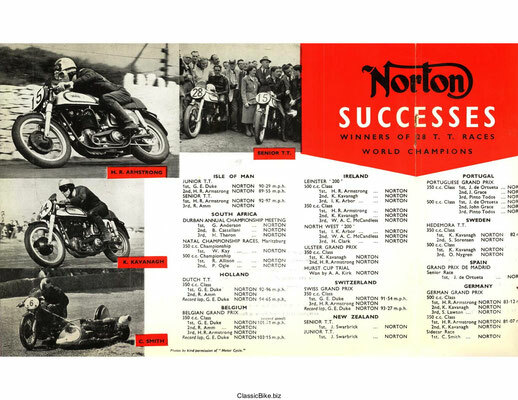 A new company, Norton Motors Ltd was formed shortly afterwards, with James Lansdowne Norton and Bob Shelley, using the services of Dan "Wizard" O'Donovan, racer and master tuner. 1915 Although there was little involvement in the Great War, production of a three-speed gearbox and all-chain drive commenced. 1920 Norton moved to Bracebridge Street, and remained there until 1963. 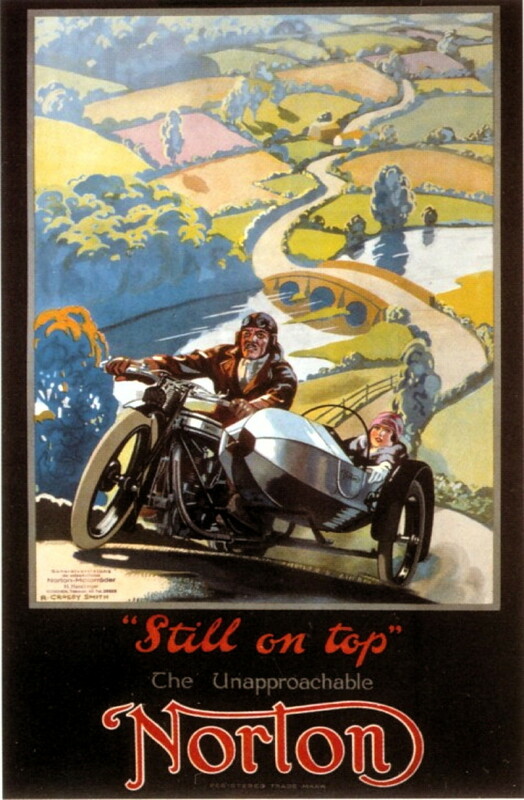 1925 James Lansdowne Norton died at the age of 56, after two years of ill health. 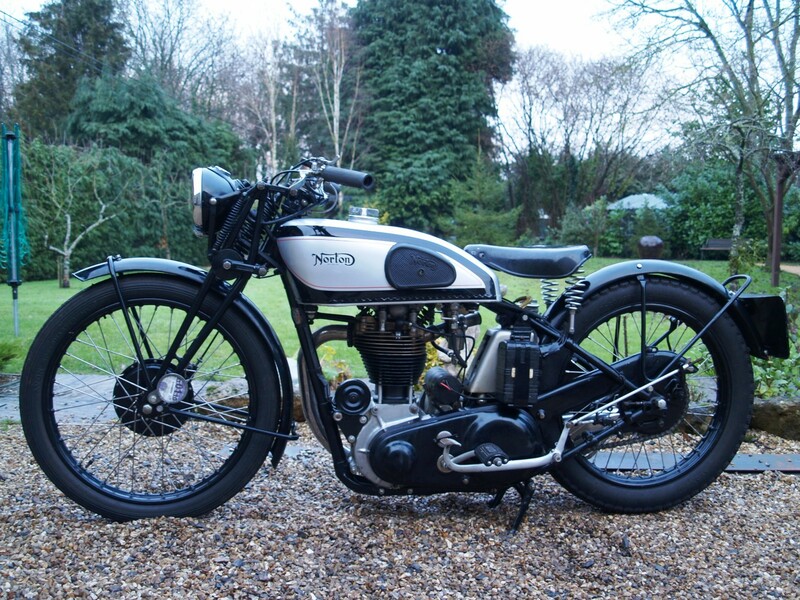 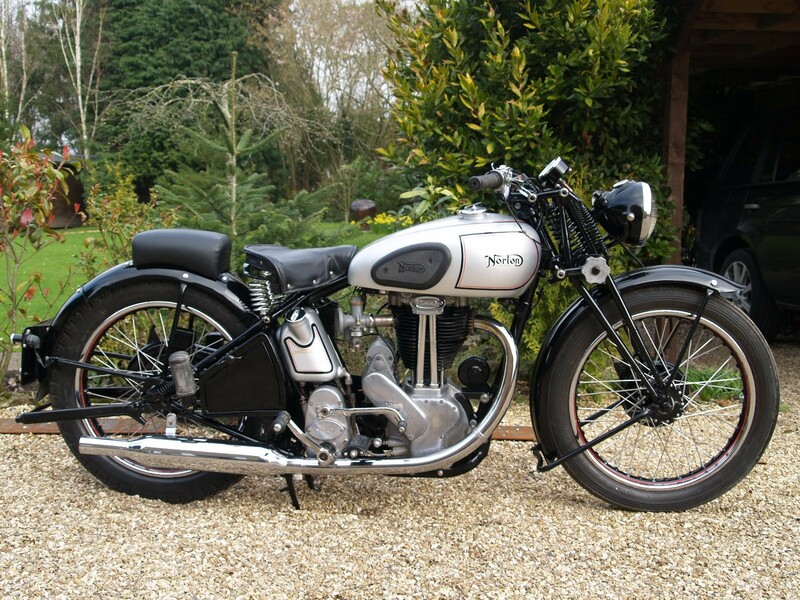 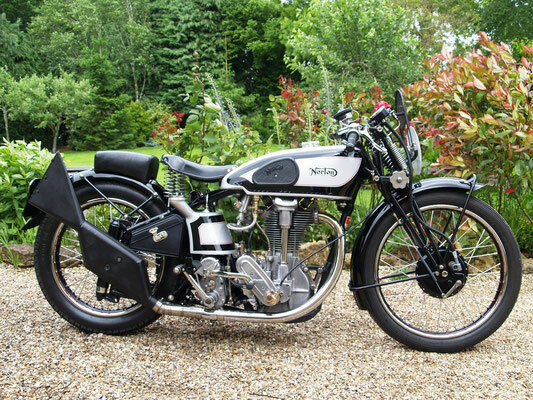 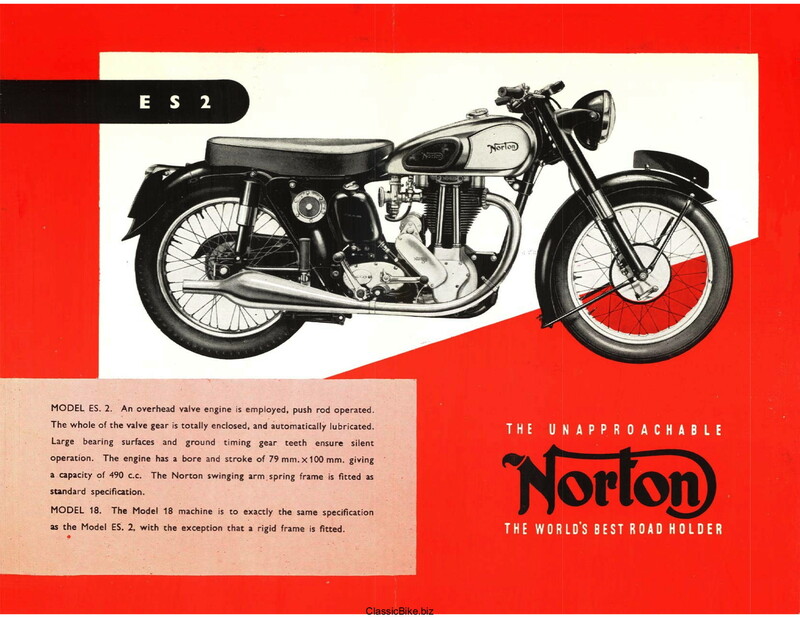 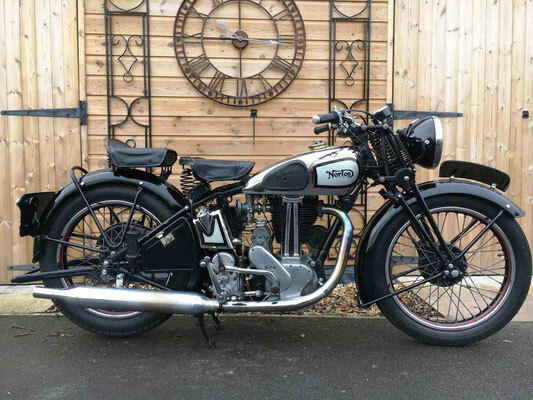 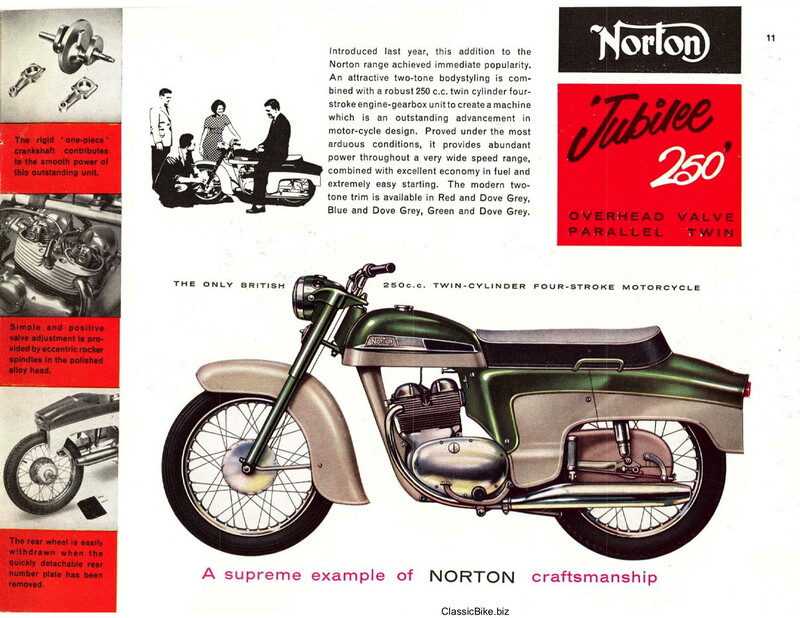 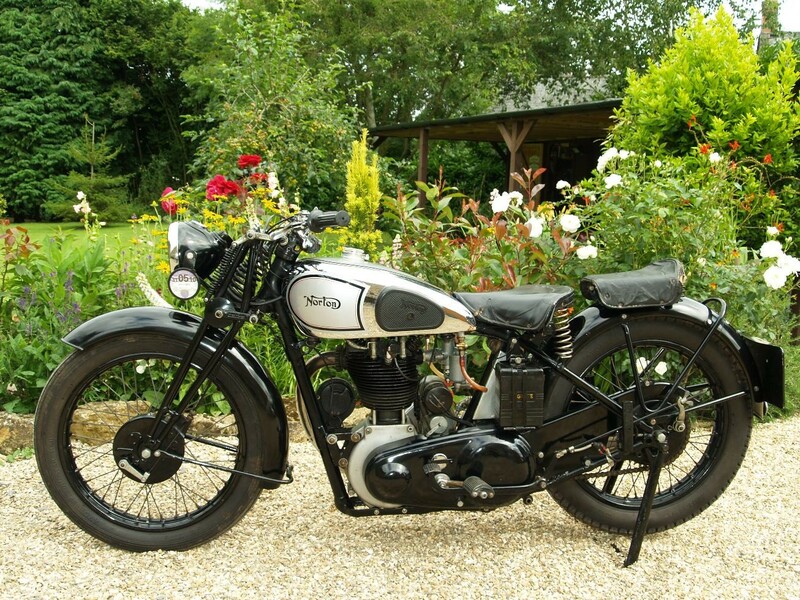 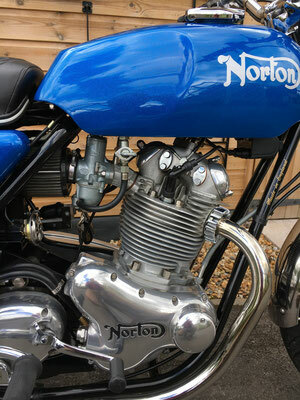 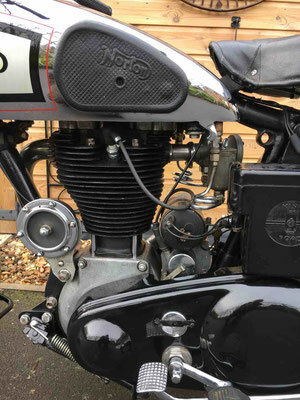 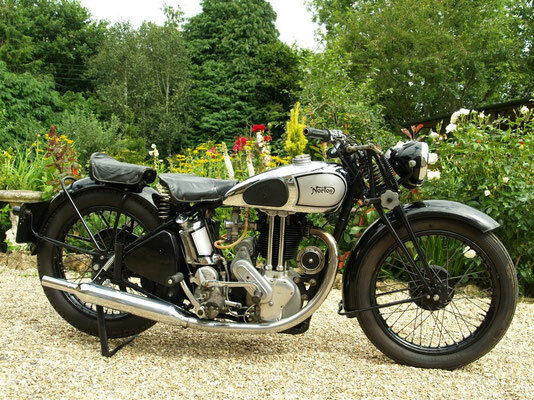 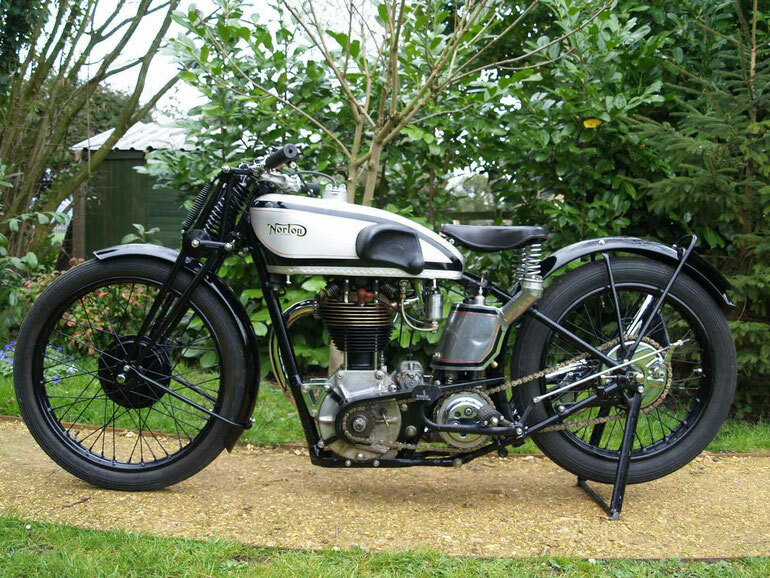 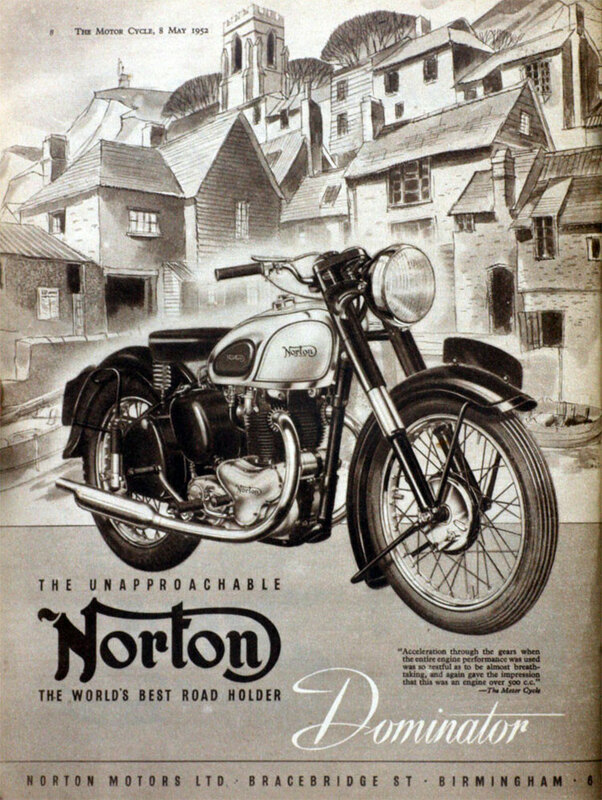 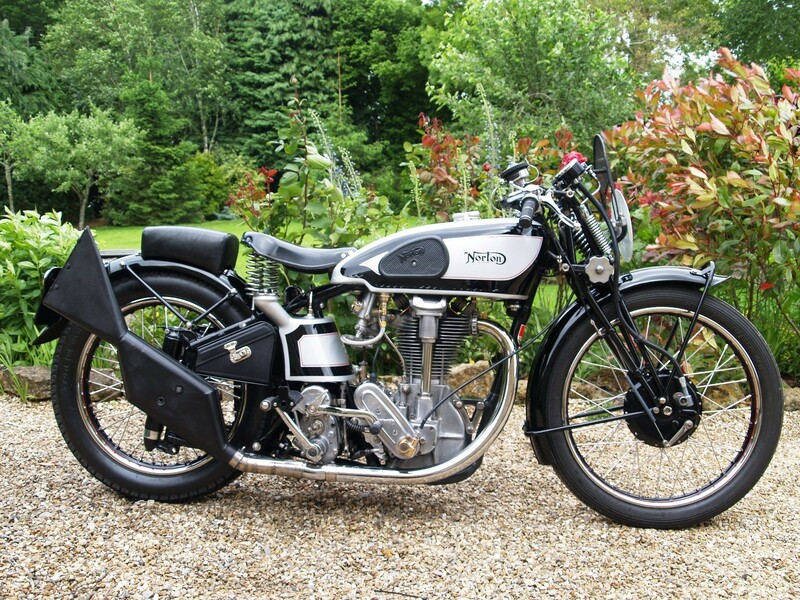 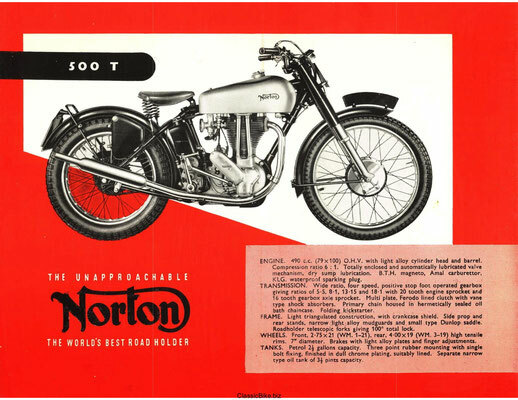 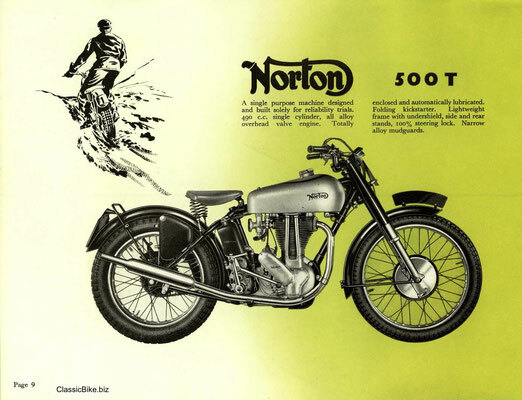 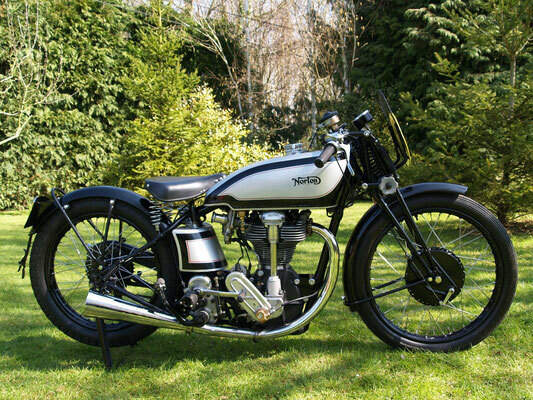 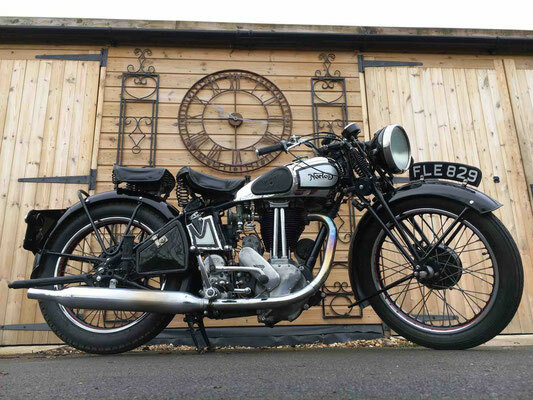 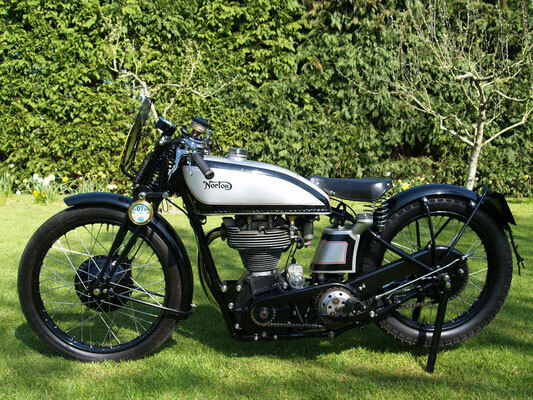 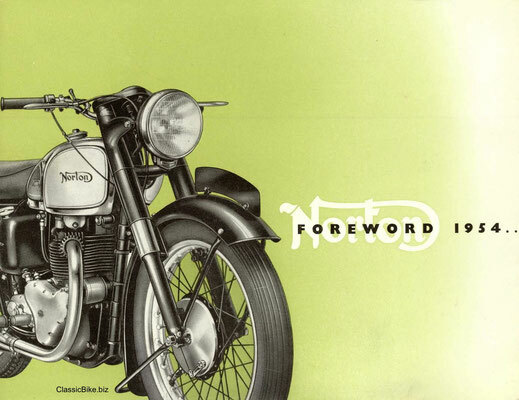 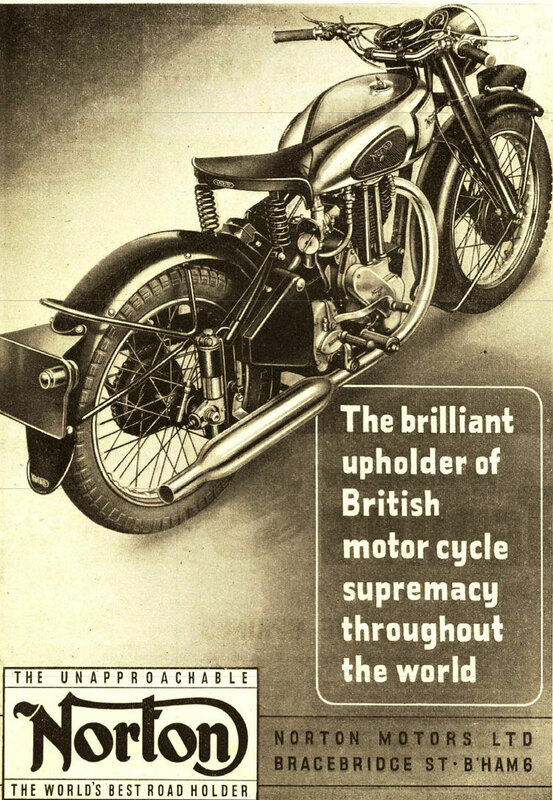 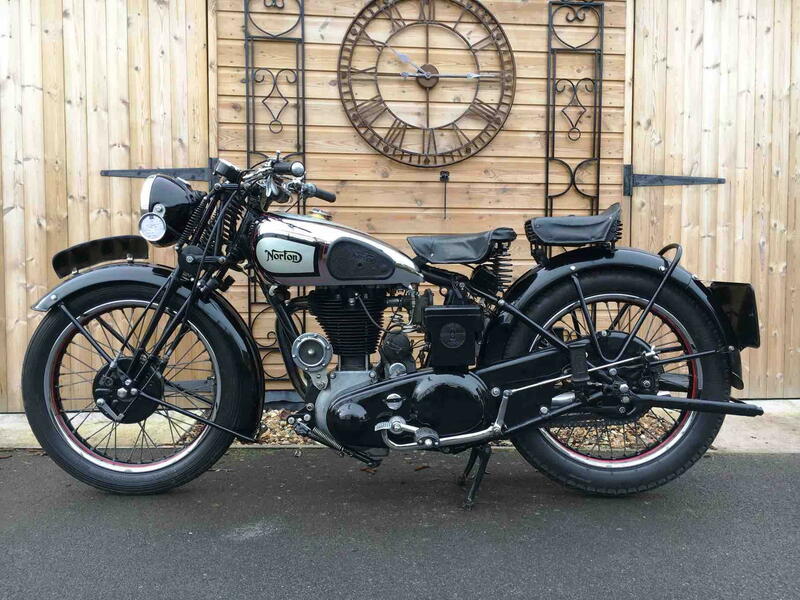 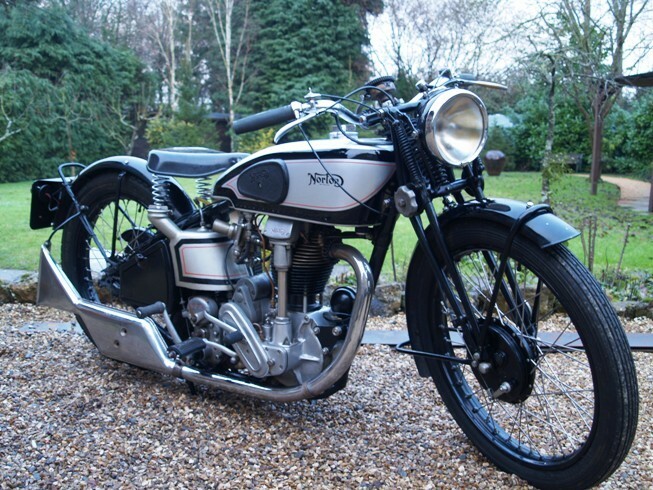 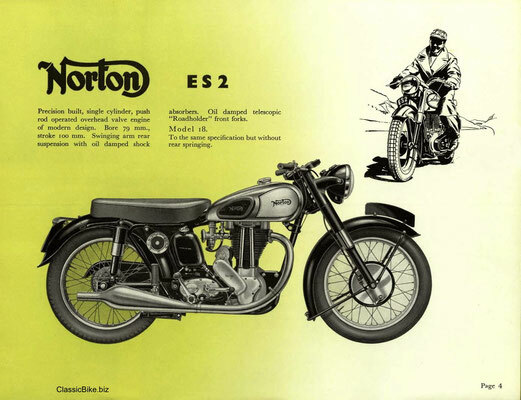 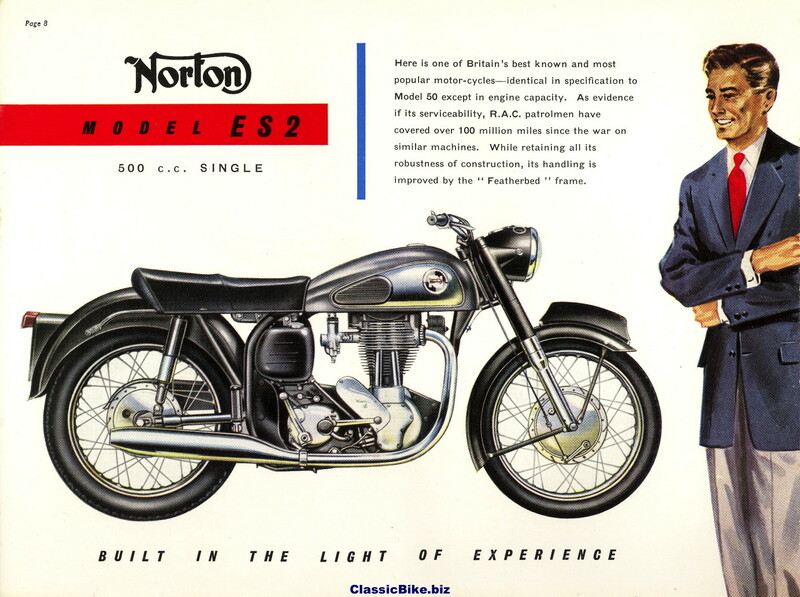 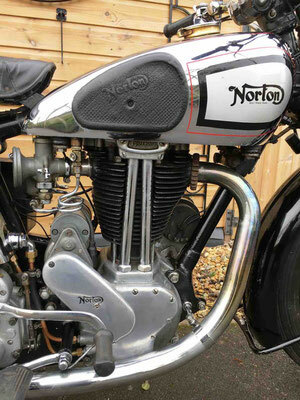 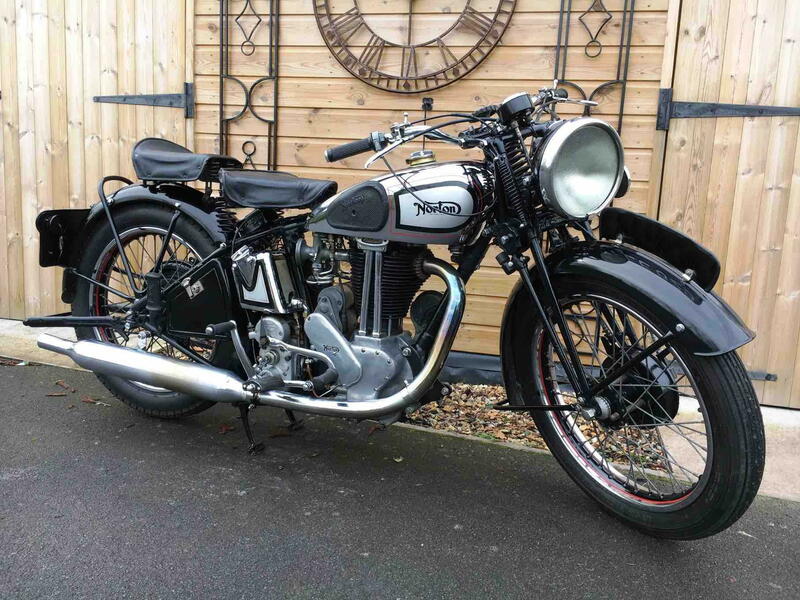 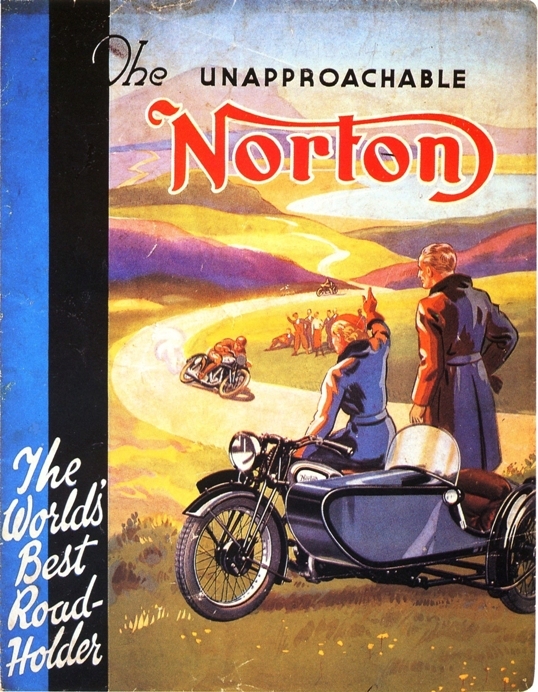 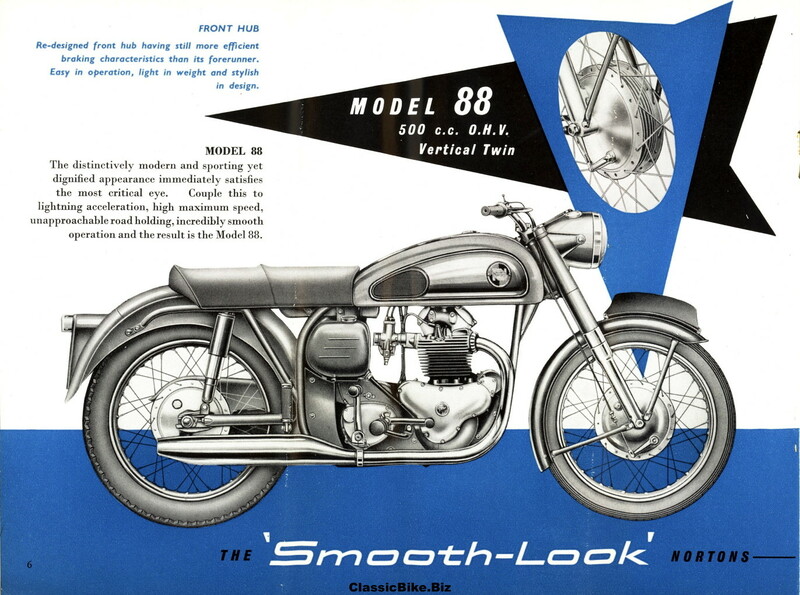 1926 Public company formed as Norton Motors (1926) Ltd.
1927 A new ohc engine, designed by Walter Moore, first appeared. This had the magneto behind the engine (rather than in front), and a camshaft driven by shaft and bevels, all mounted on a new cradle frame. 1929 Walter Moore left the company and was replaced by Joe Craig who became famous as the firm's race director. He co-designed an engine with Arthur Carroll that was one of the greatest designs of all time and that remained almost unchanged for over thirty years. 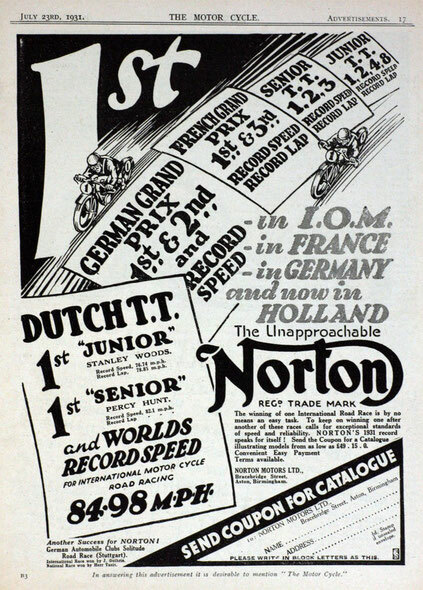 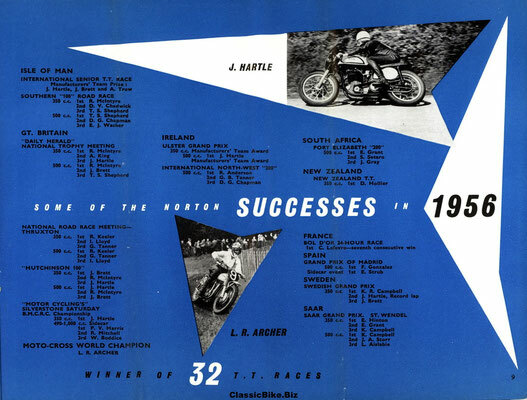 The 1930s were the glory days, when Norton was winning many races, including all but two Senior and Junior TT races between 1931 and 1938. 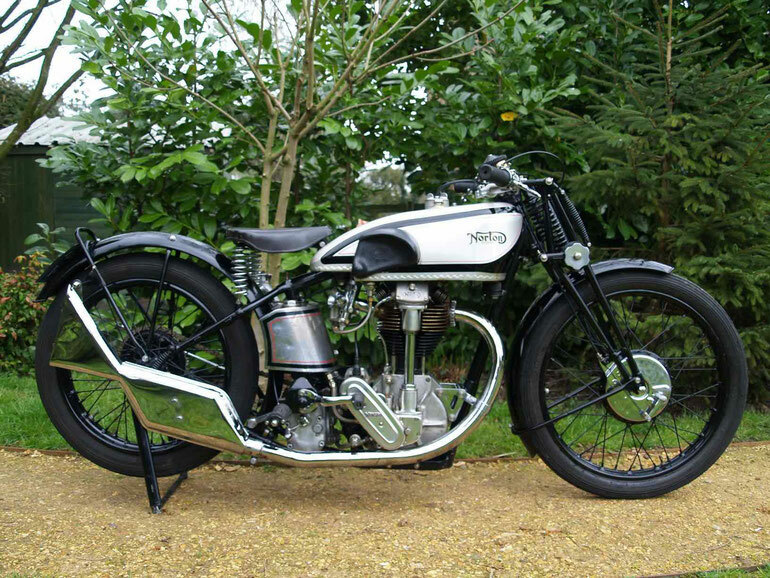 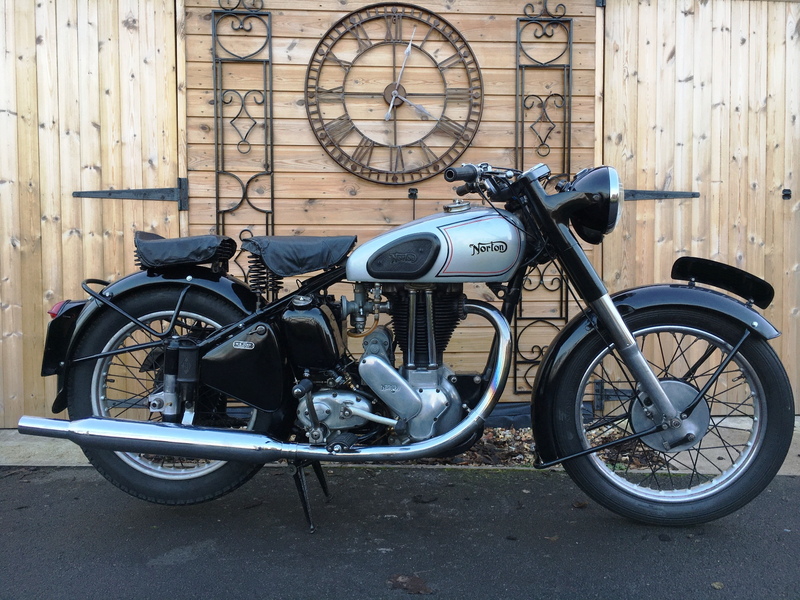 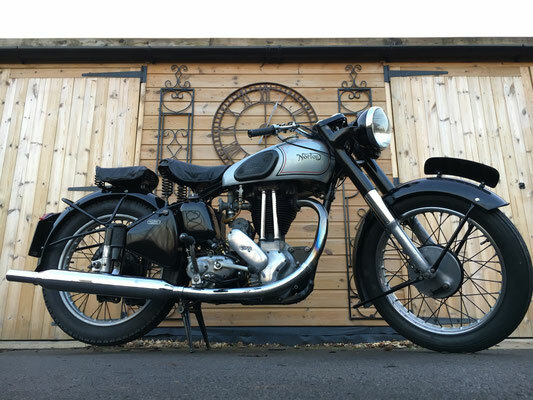 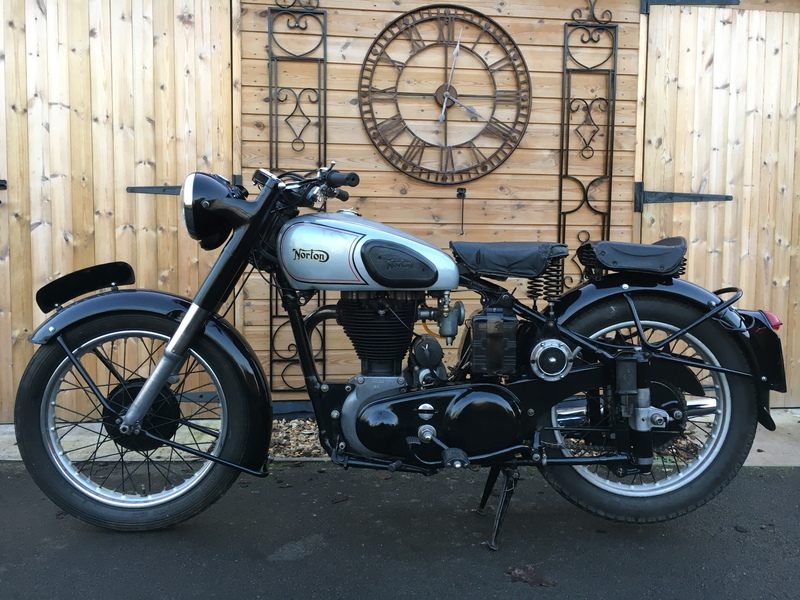 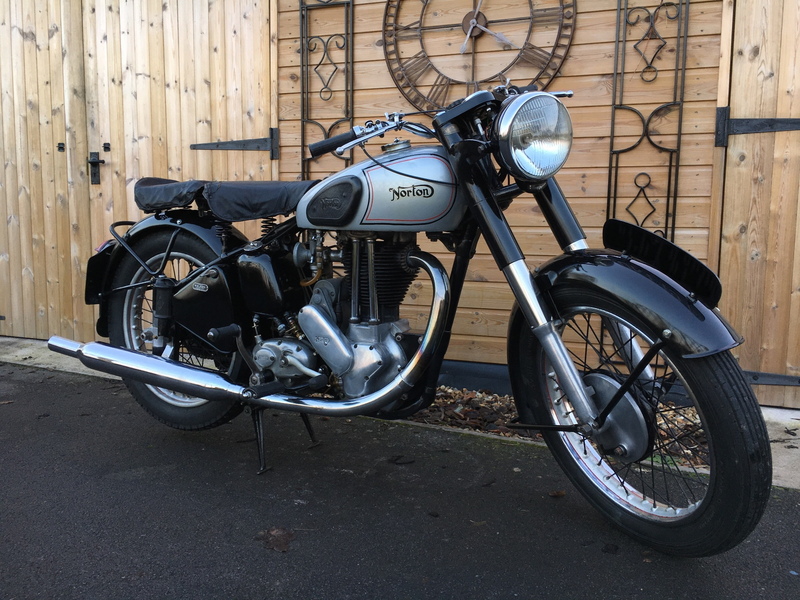 The most successful Norton racer was the 499cc single Model 30 International, first released in 1932 and made until 1958. International was used for Norton's top line of sports-roadsters, originally intended for racing but sold until 1939 in road guise to the public. 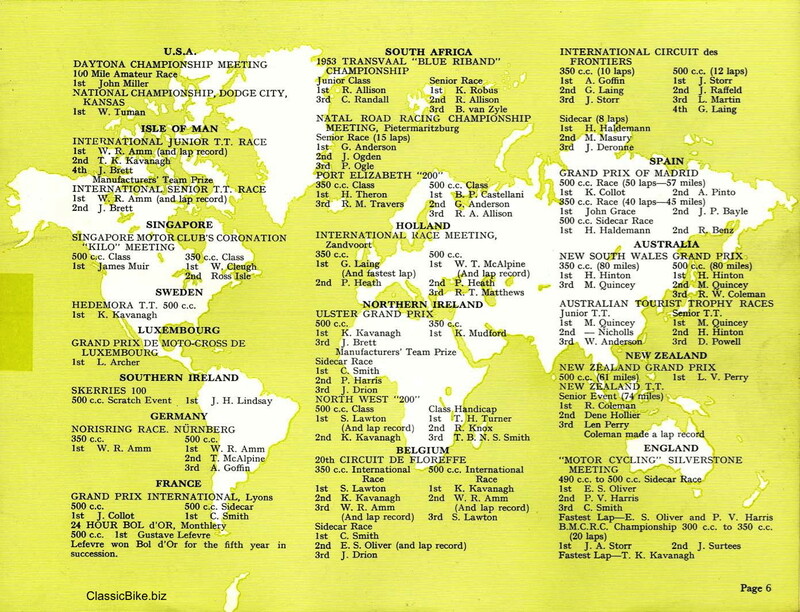 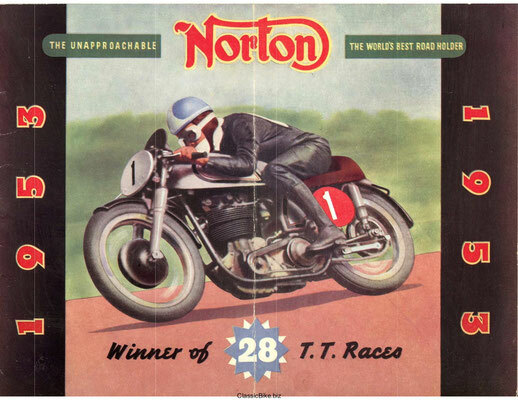 Norton's predominance remained in the racing world for much of the decade - until the outbreak of war. 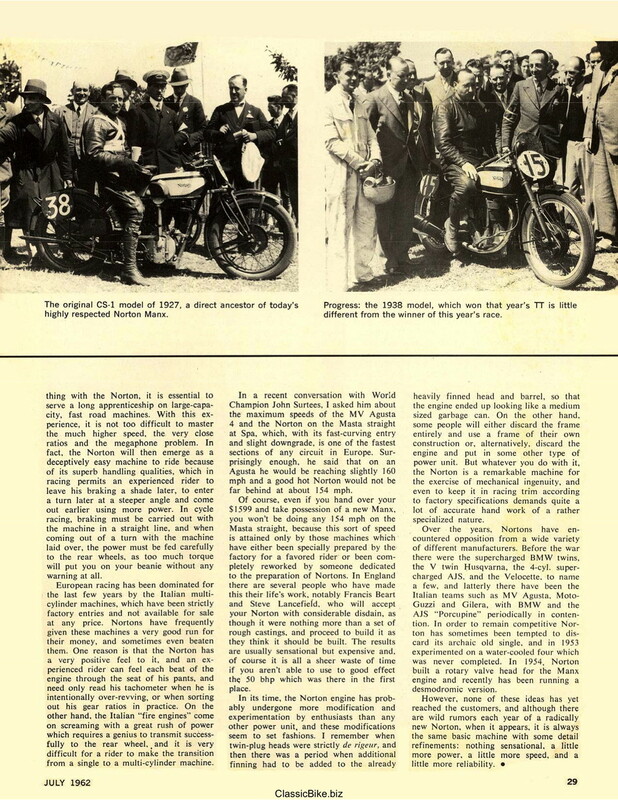 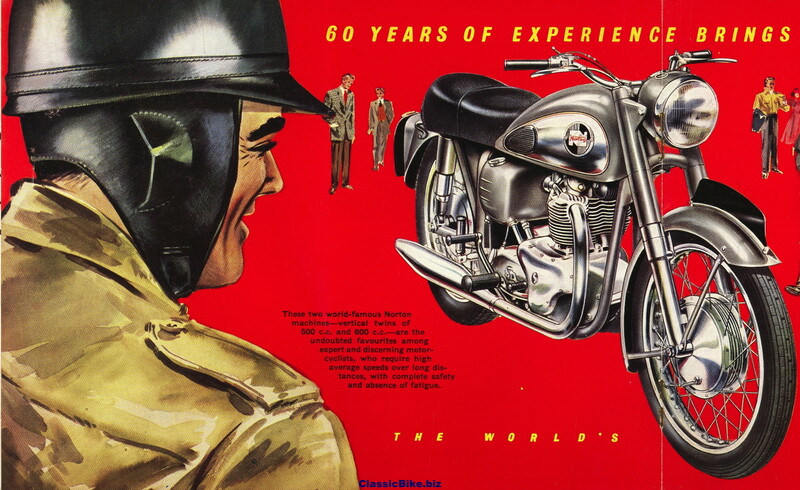 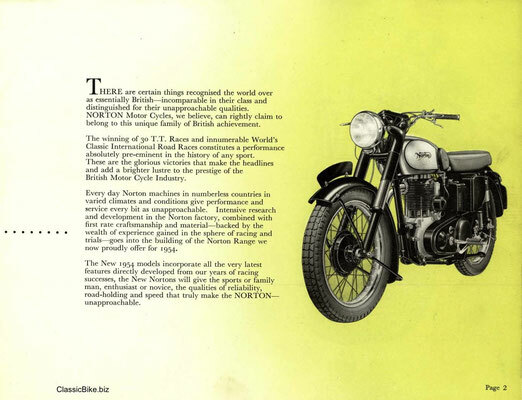 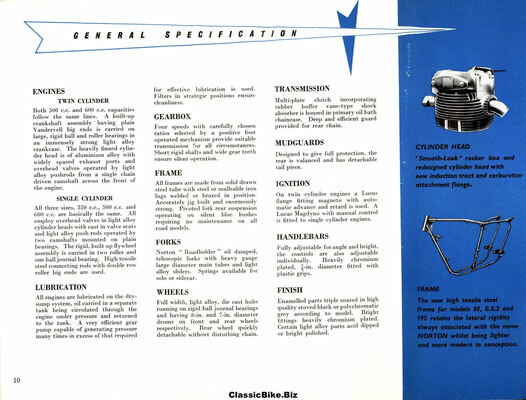 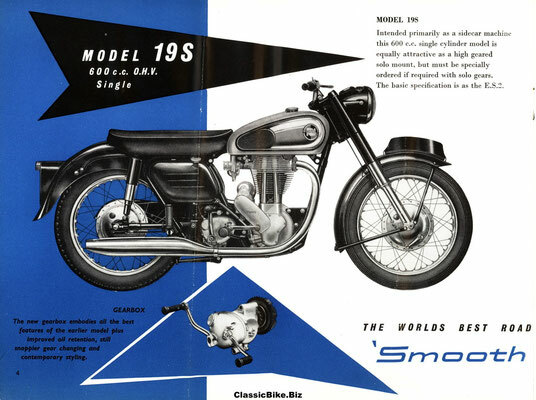 World War II - Large numbers of motorcycles were produced for the services. 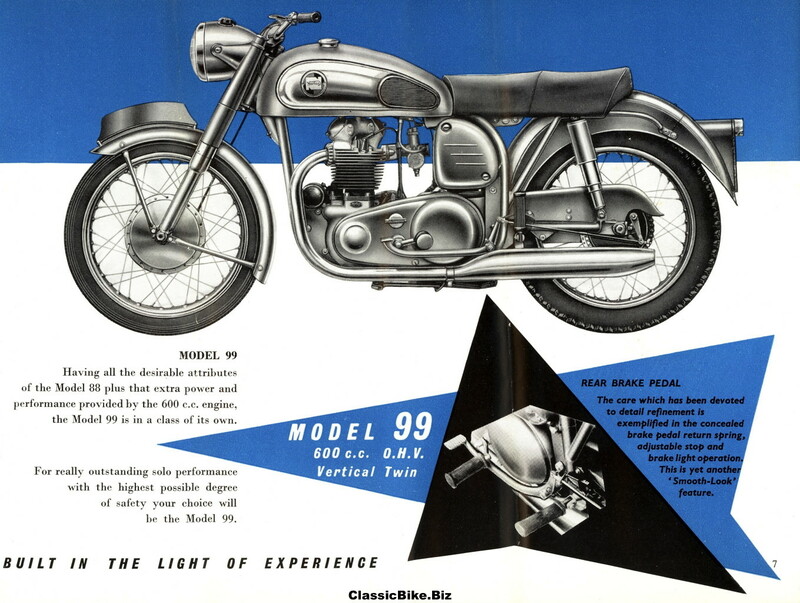 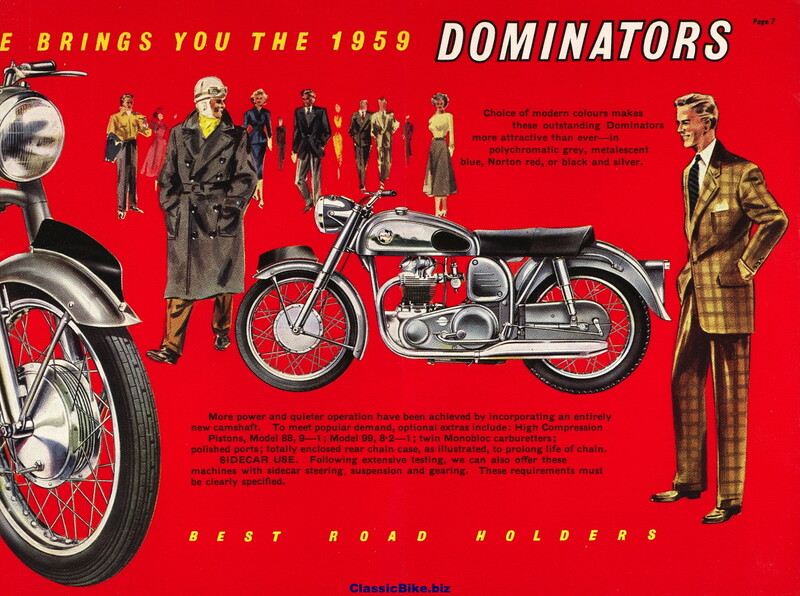 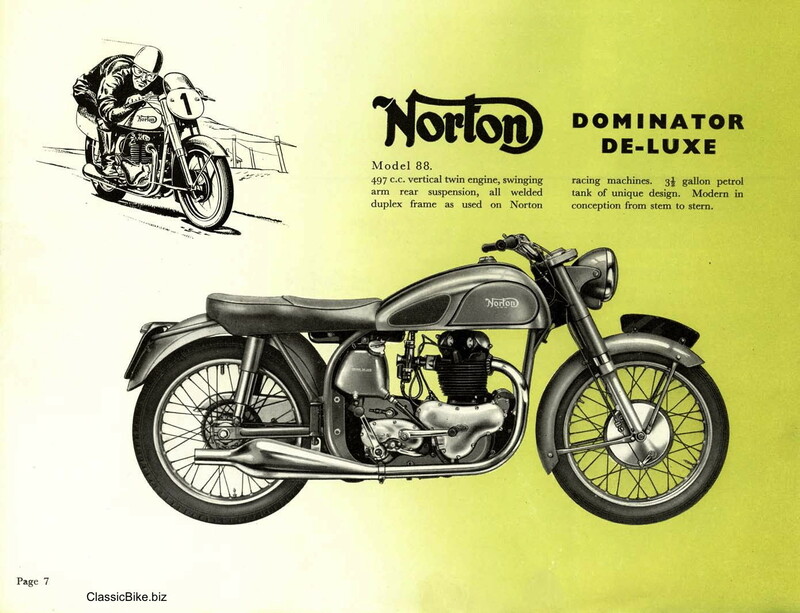 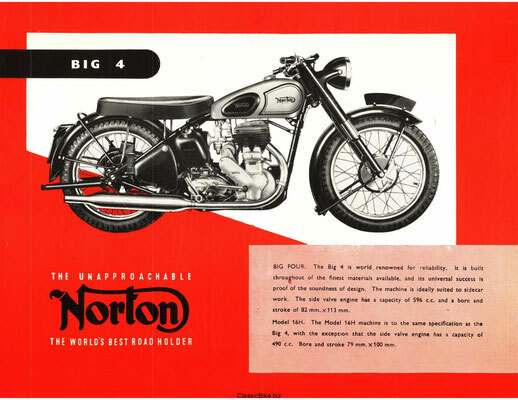 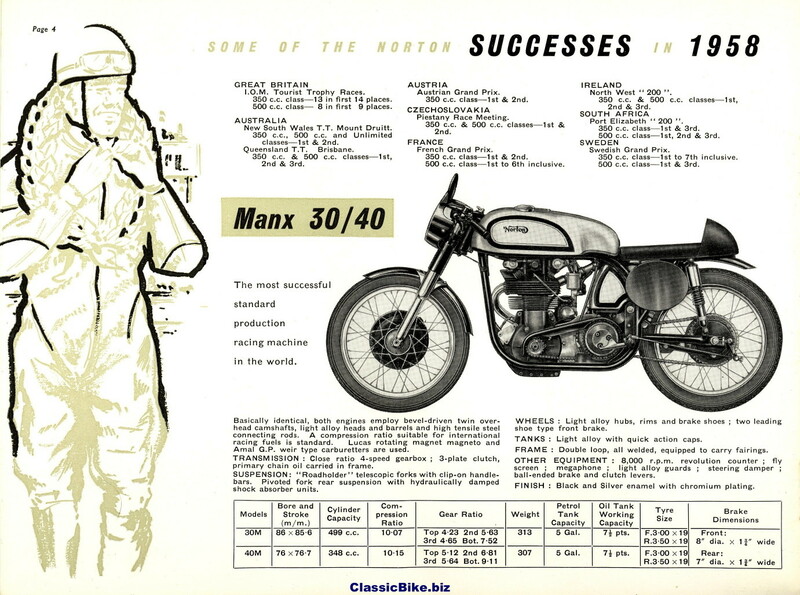 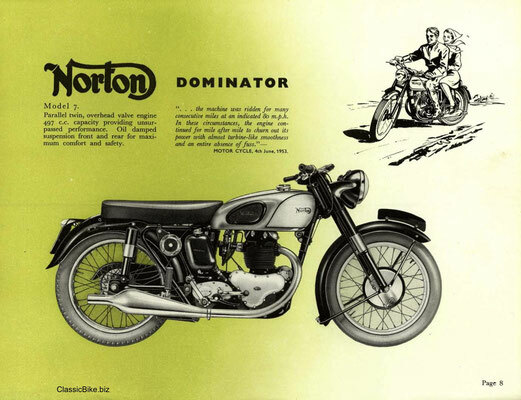 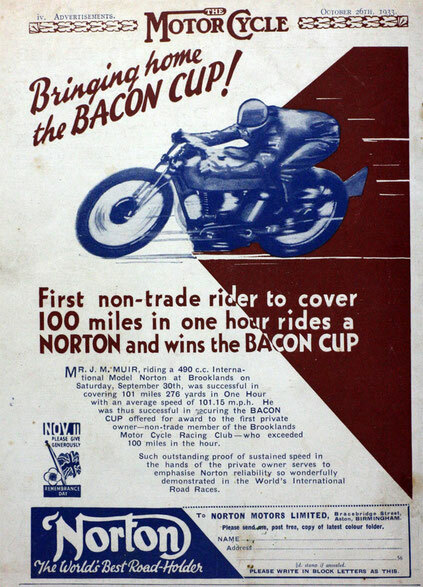 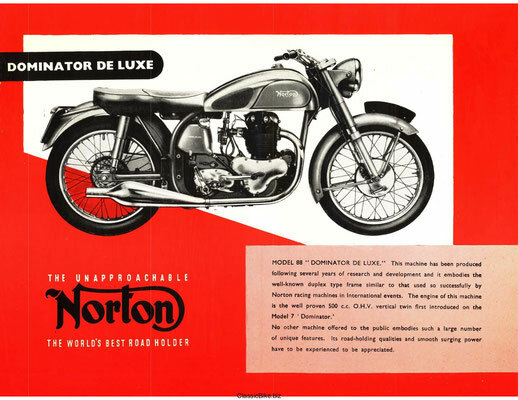 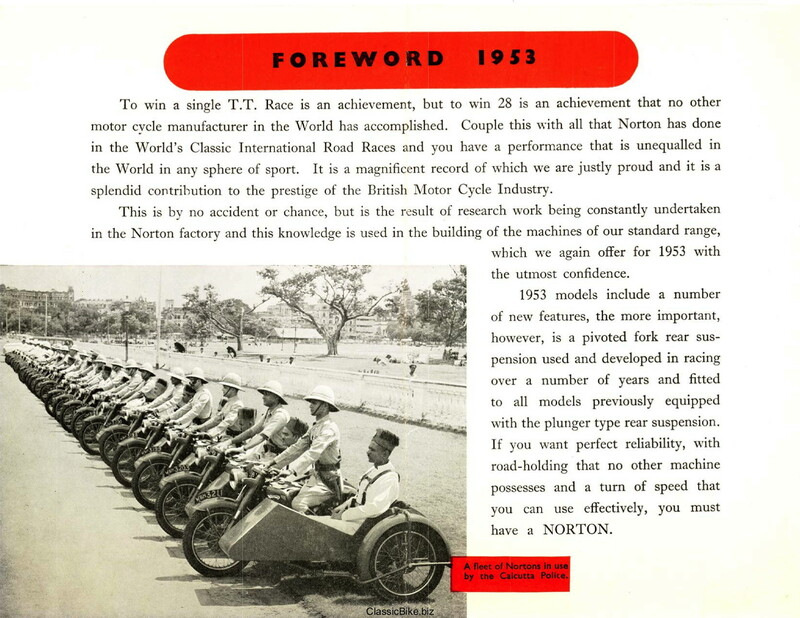 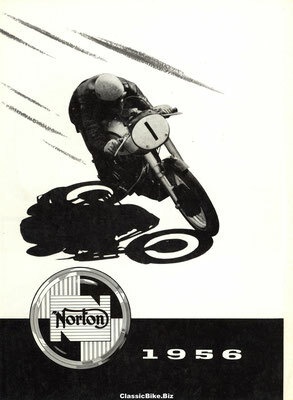 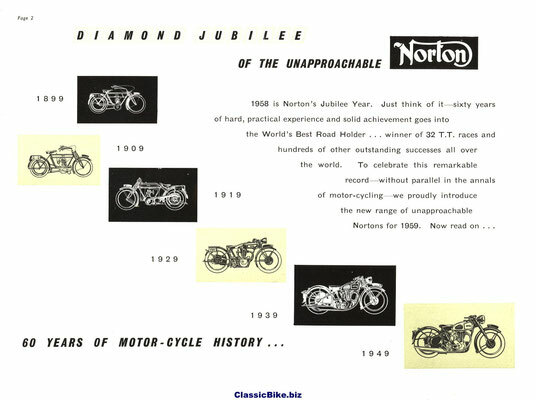 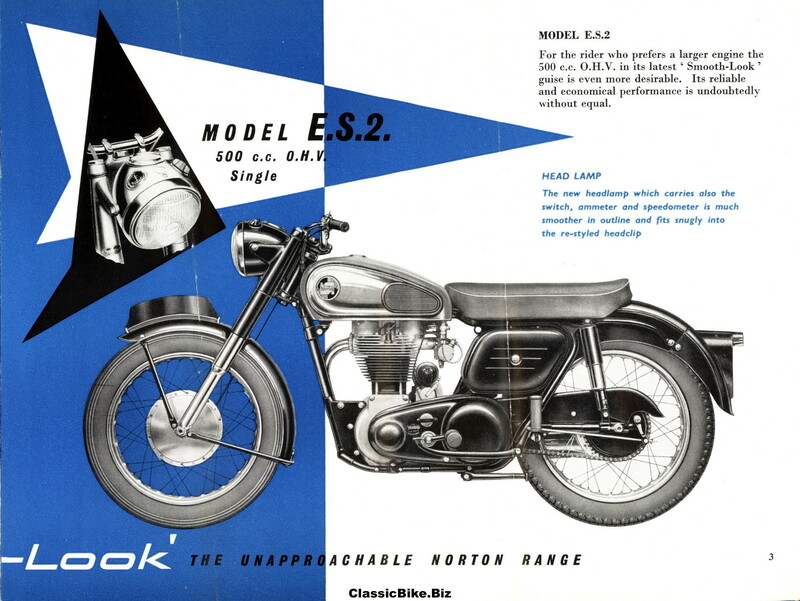 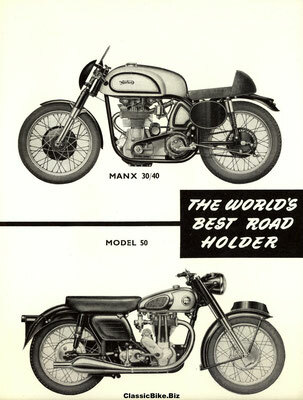 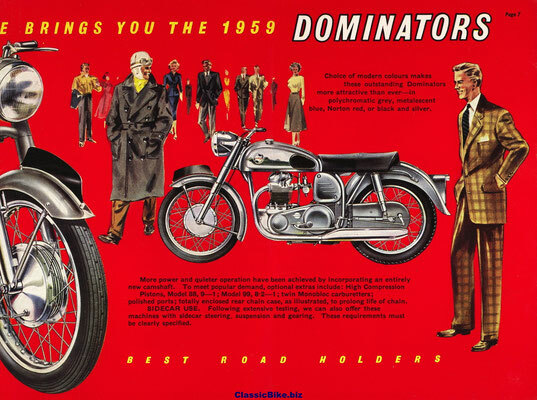 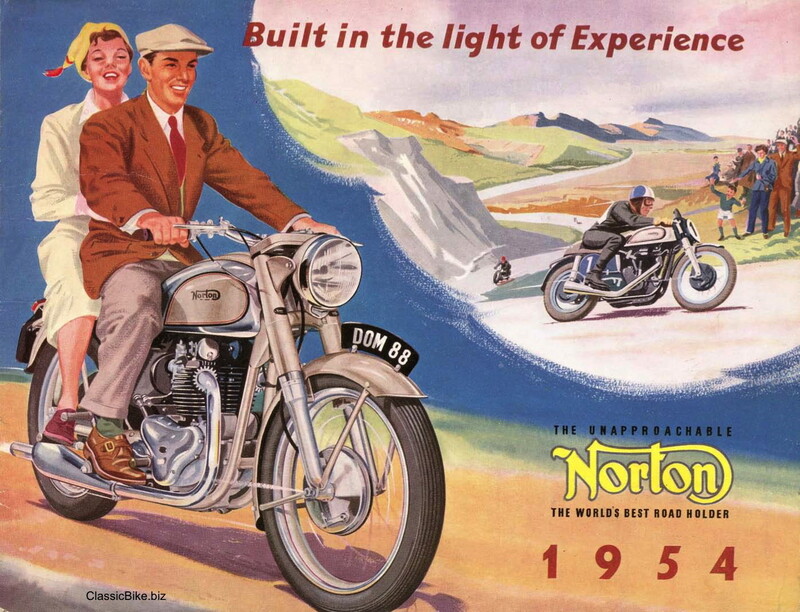 From 1949 to 1951, Norton won at Daytona, but the company withdrew official support for racing in 1955. 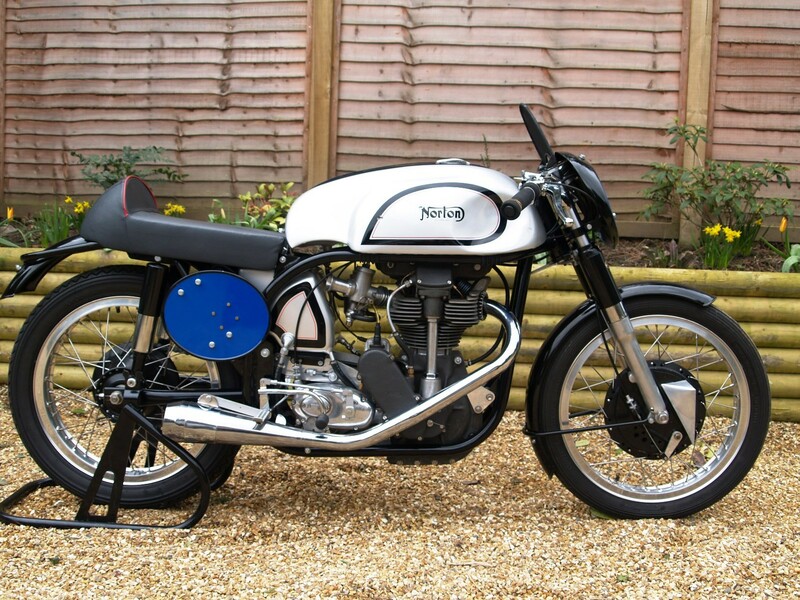 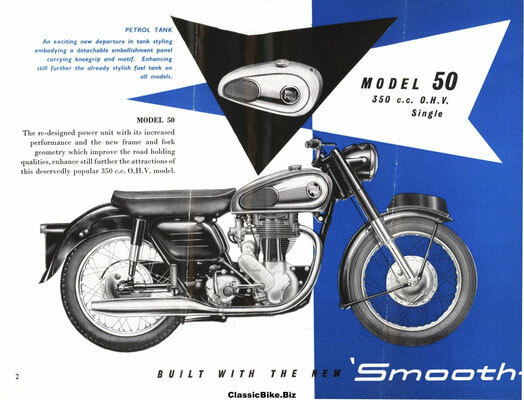 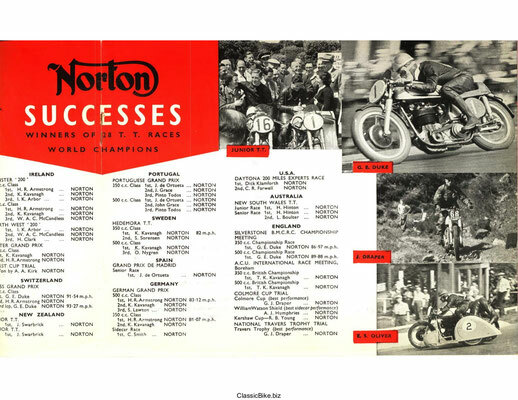 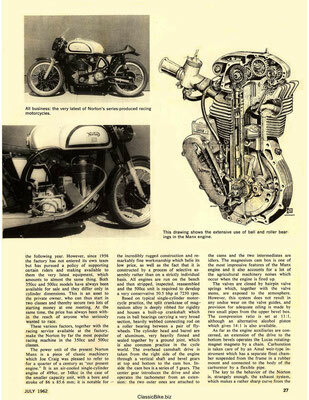 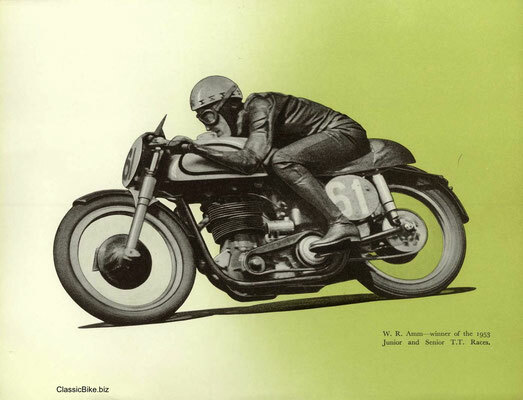 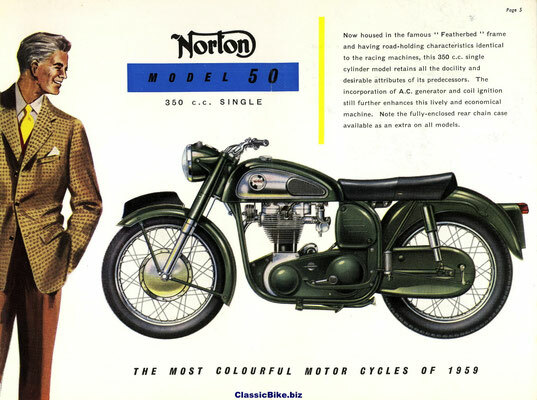 Despite the racing successes, Norton was in financial difficulty, and in 1953, Norton was sold to Associated Motorcycles (AMC) including its wholly-owned subsidiary R. T. Shelley[. 1956 After many years of service and notable contribution to Norton, Joe Craig retired. 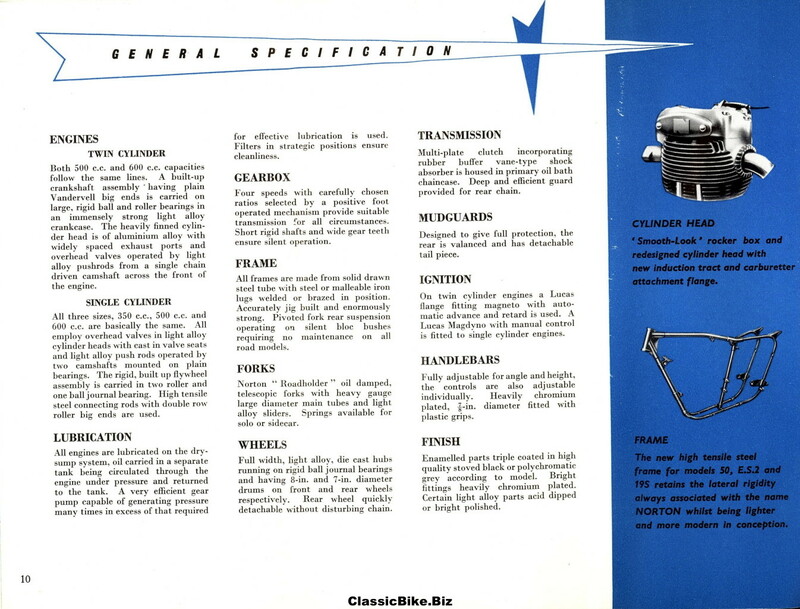 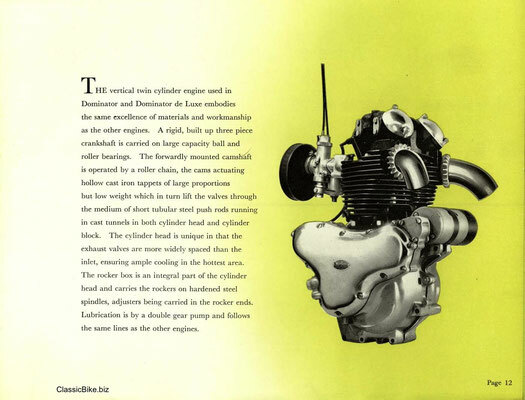 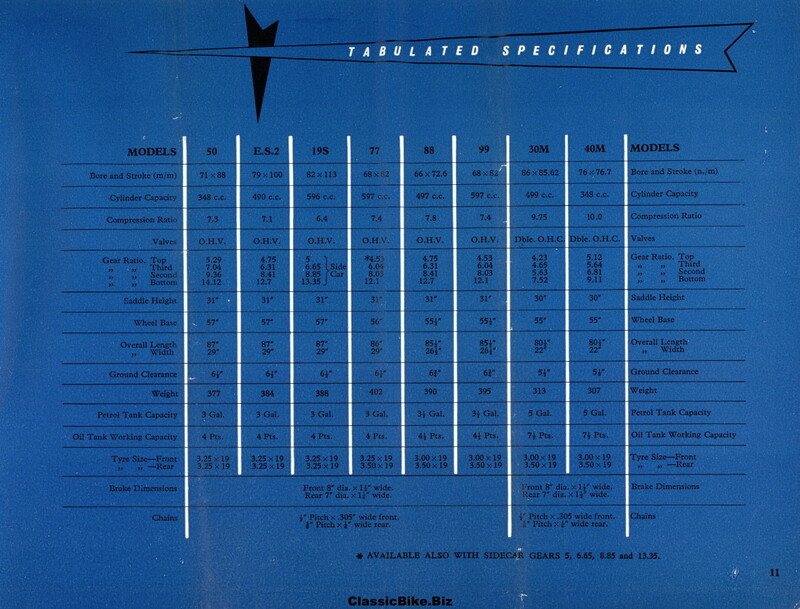 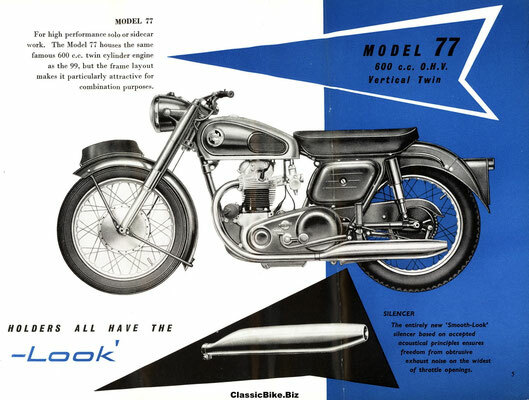 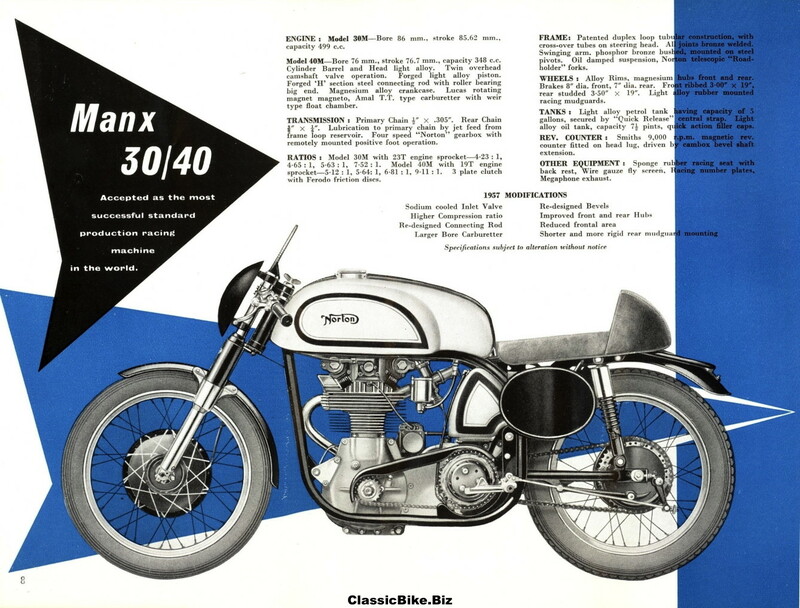 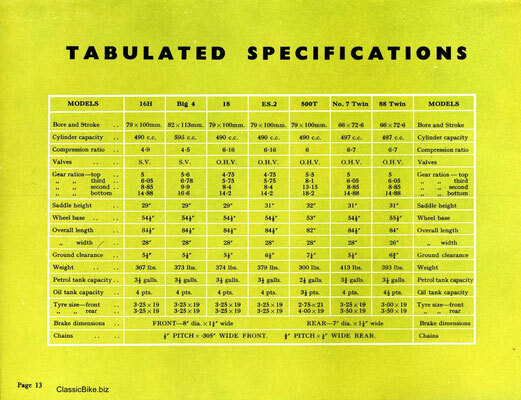 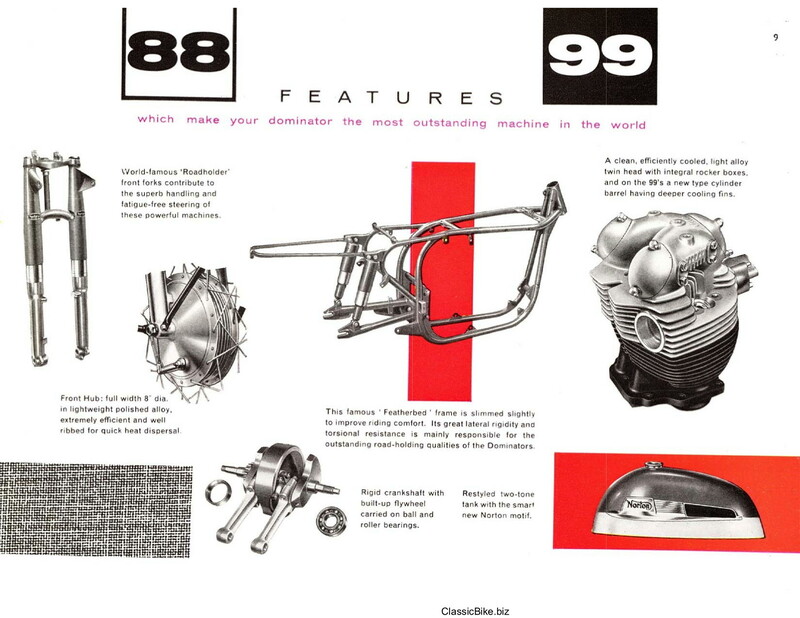 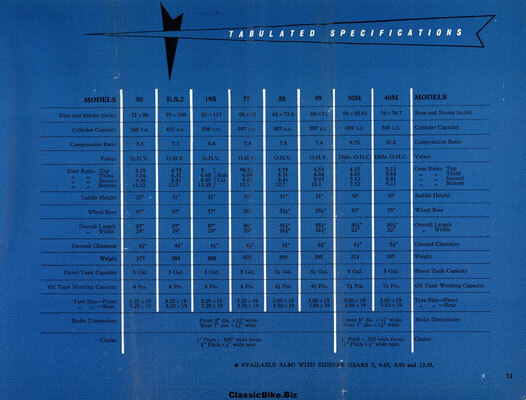 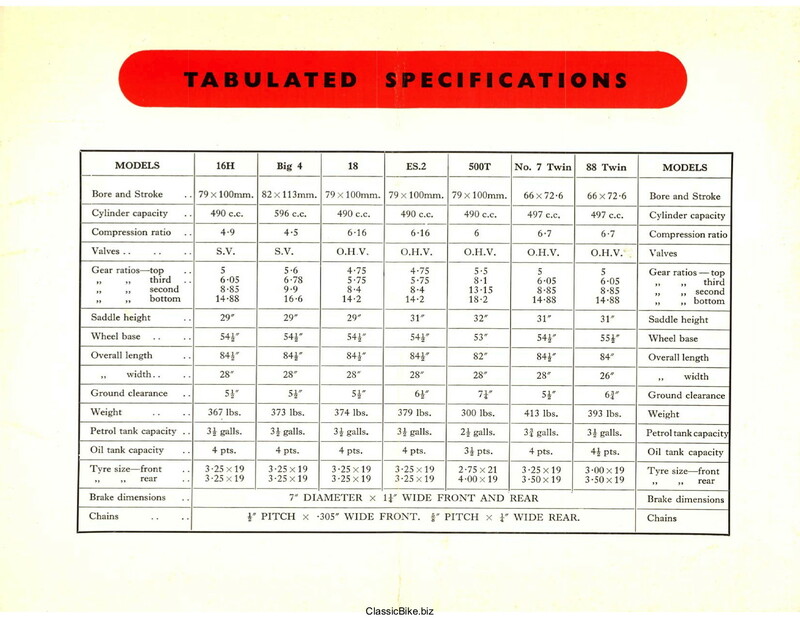 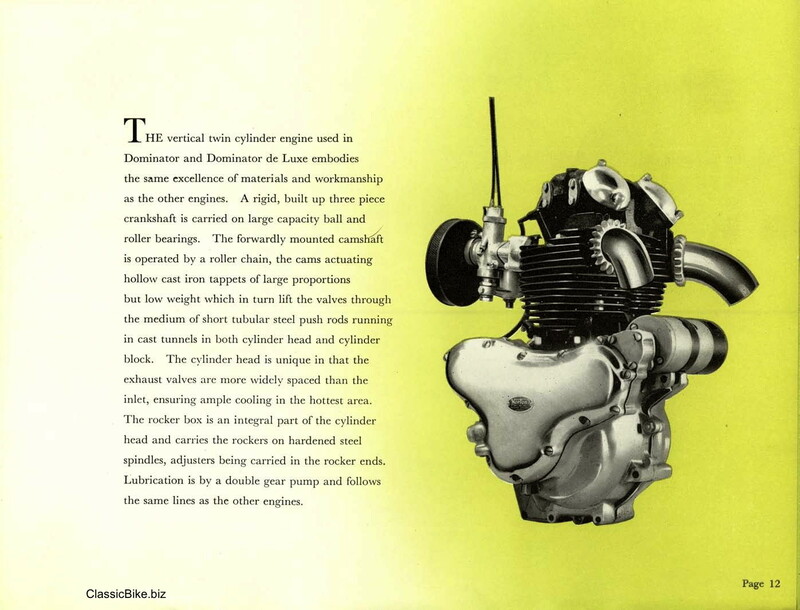 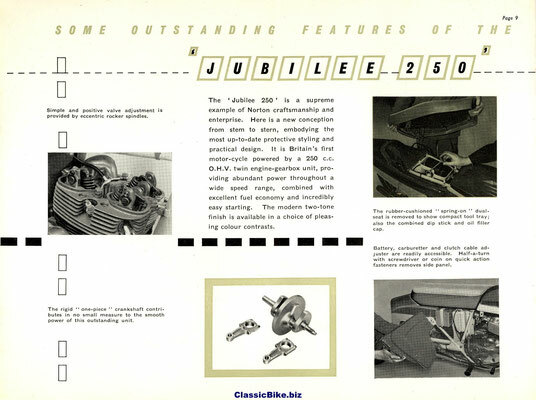 1959 Brought radical changes and a new machine based on a Francis-Barnett design. 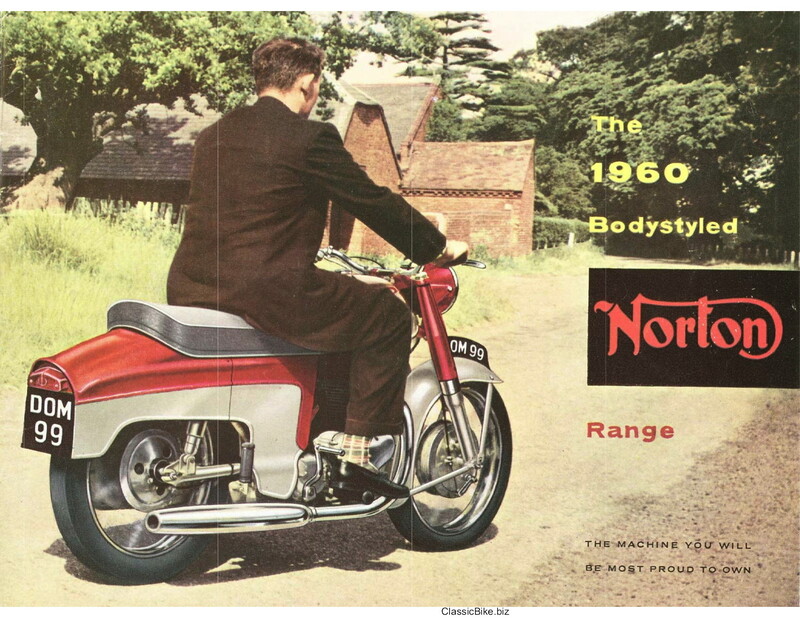 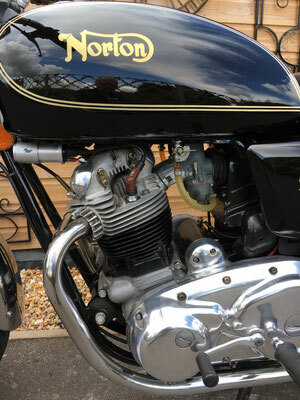 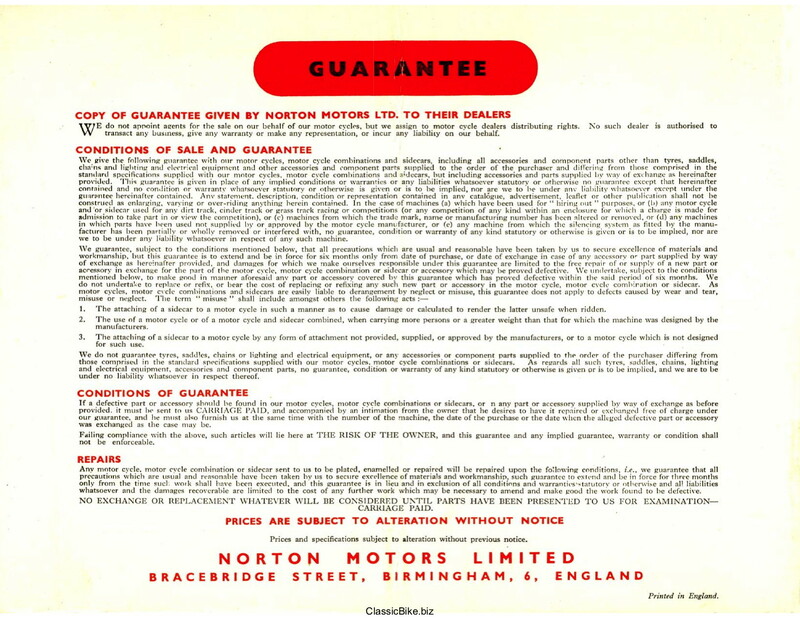 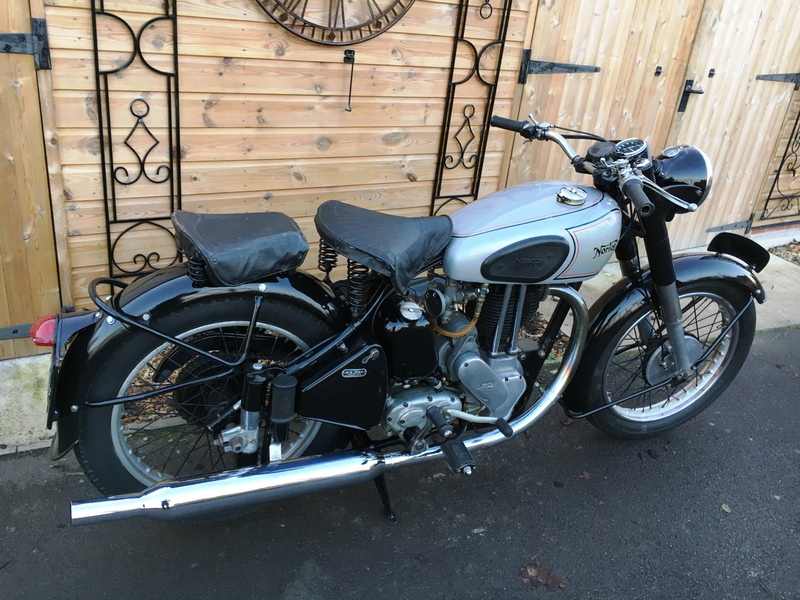 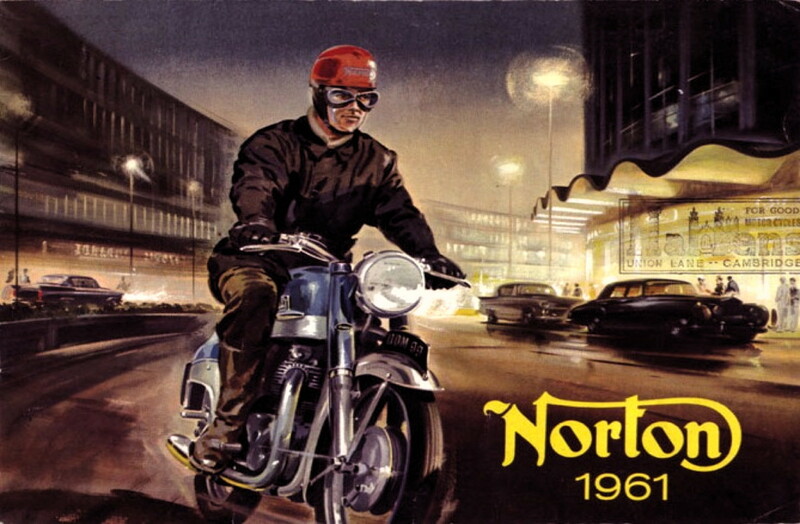 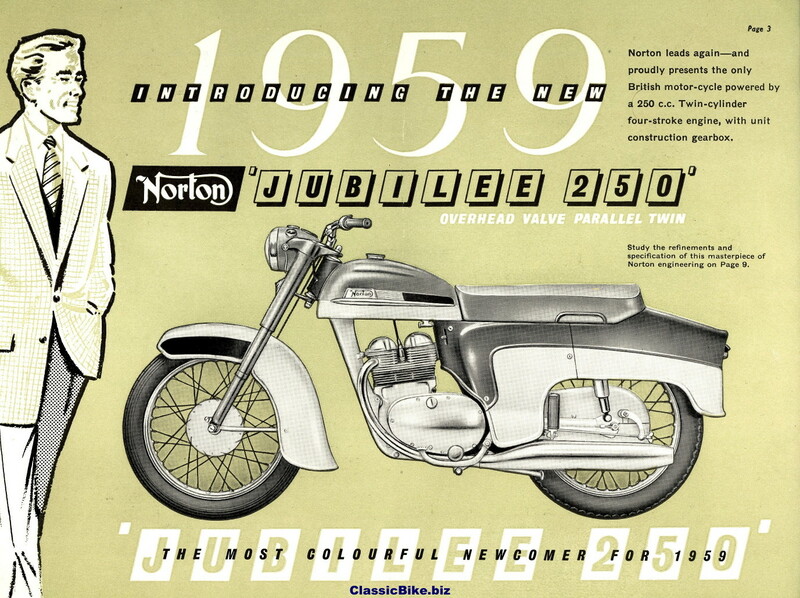 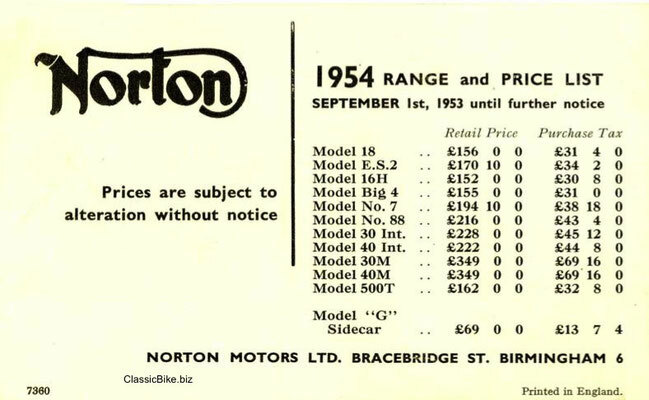 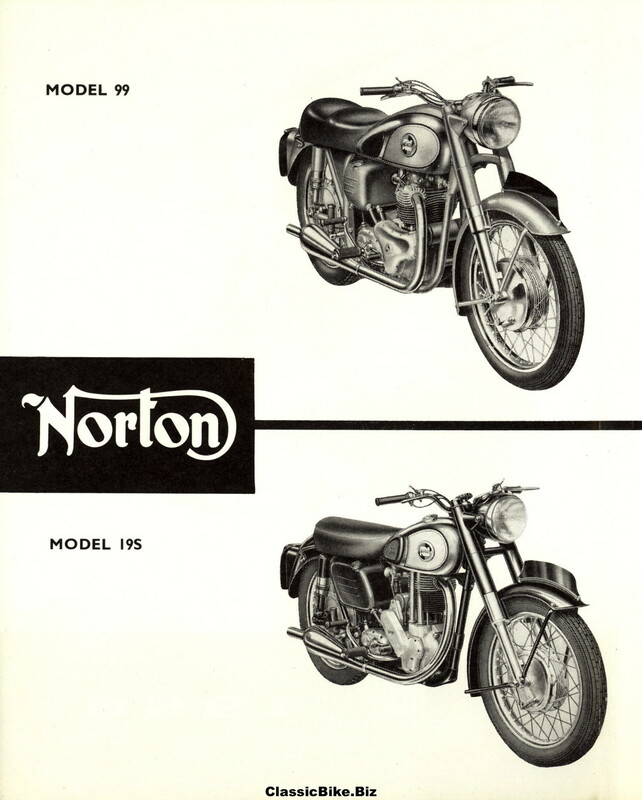 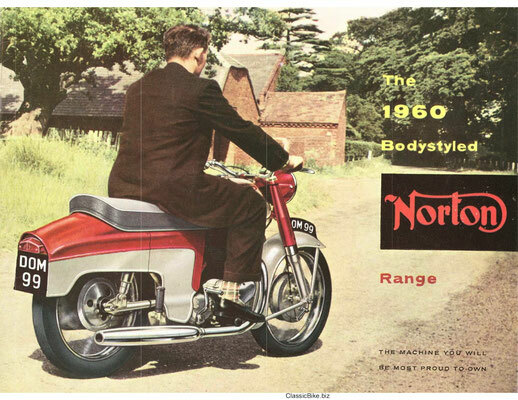 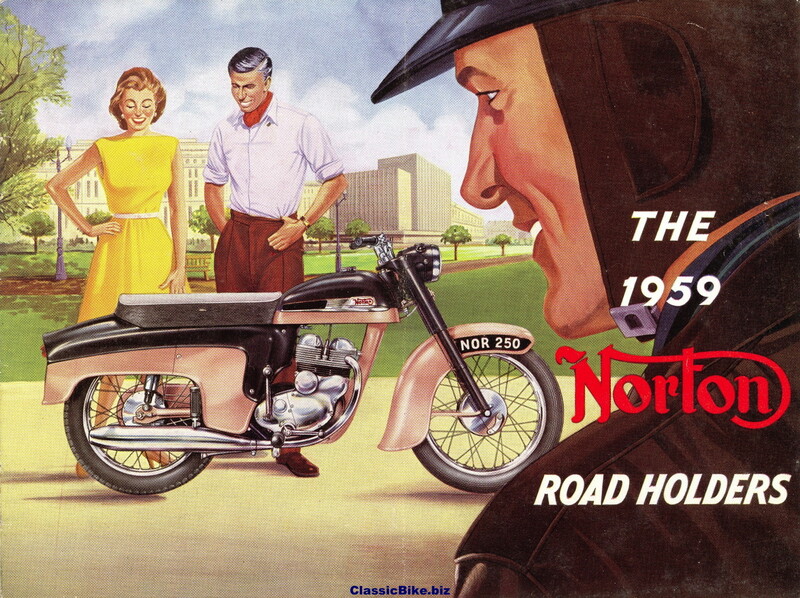 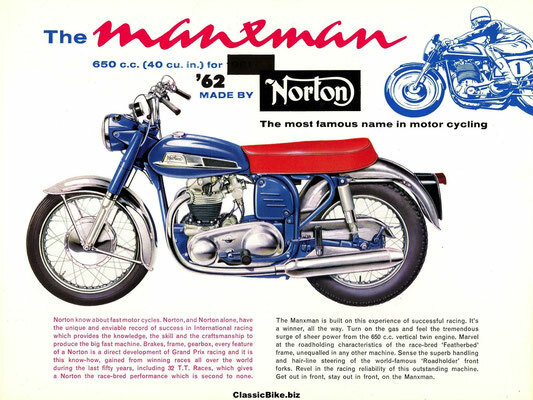 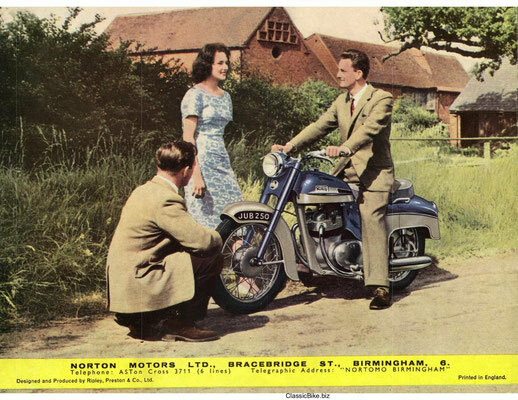 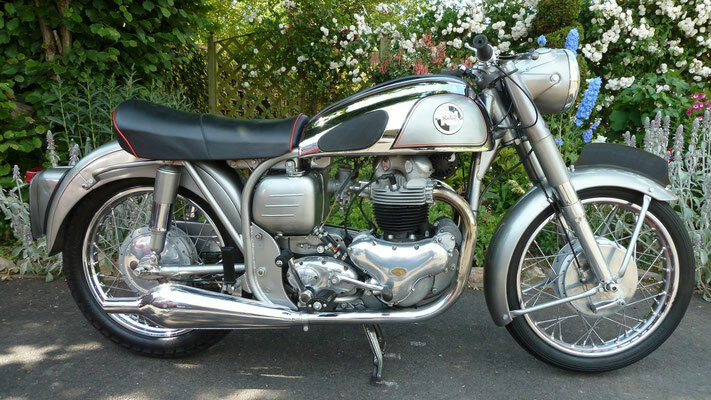 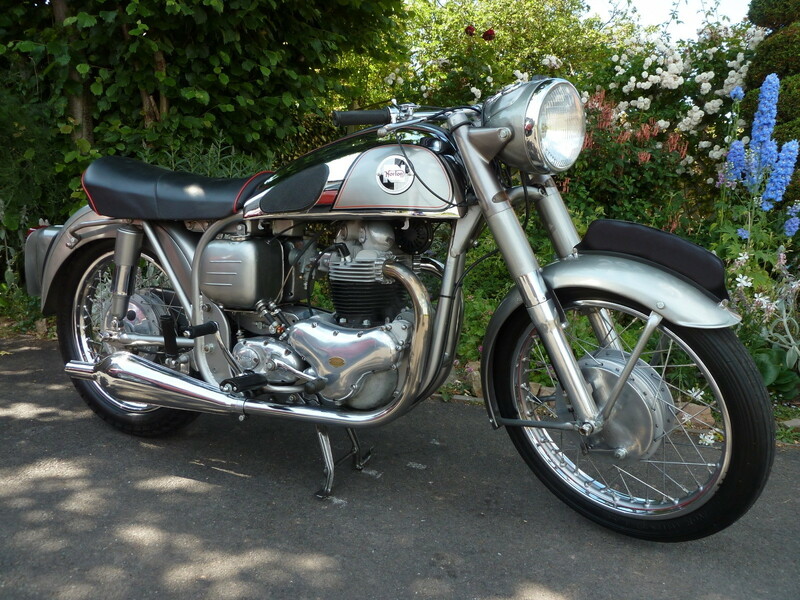 1961 Listed as Norton Motors Ltd a subsidiary of AMC. 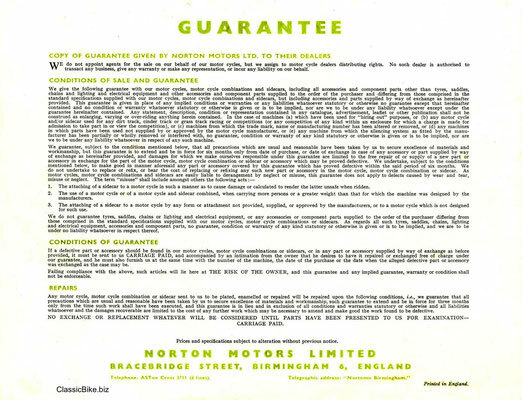 Works at 89-117 Bracebridge Street, Birmingham. 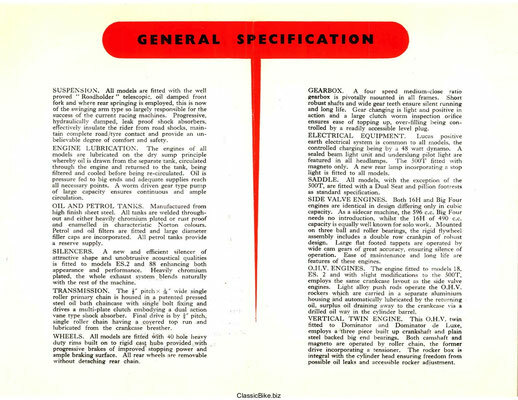 Employs 160 persons. 1962 The Birmingham factory was closed in 1962 and production was moved to AMC's Woolwich factory in Plumstead, Southeast London. 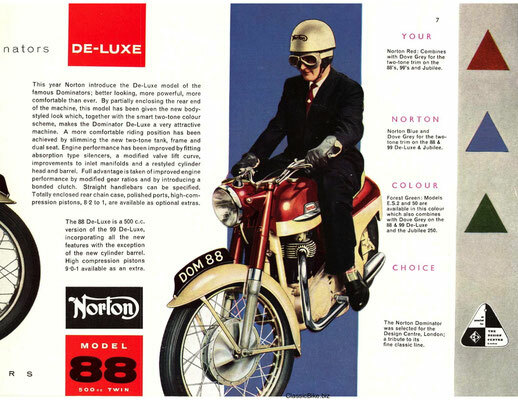 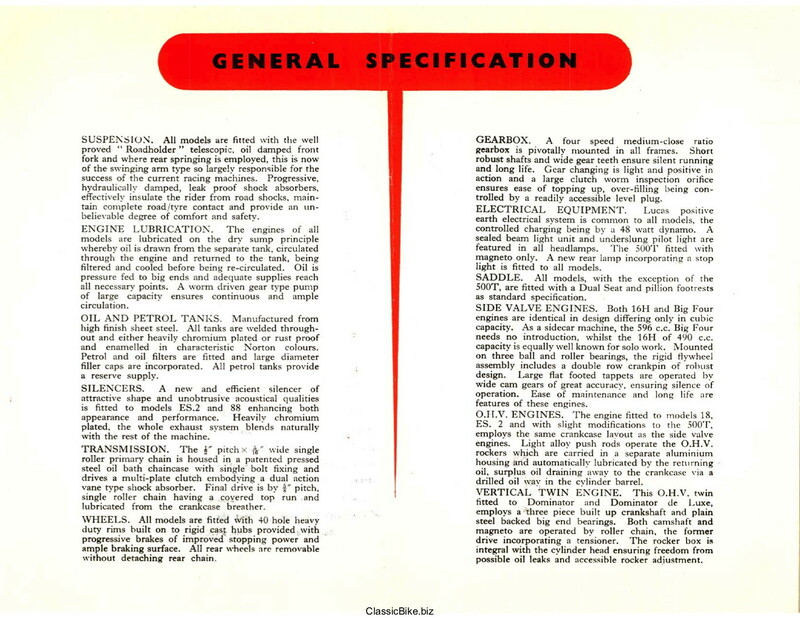 1963 The Electra 383cc went into production - this had an electric start. 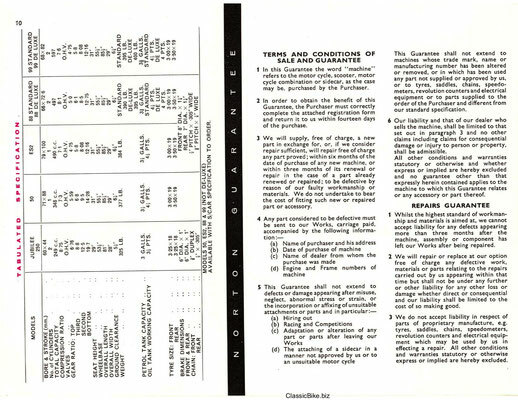 In 1966 AMC collapsed and was reformed as Norton-Villiers part of Manganese Bronze Holdings. 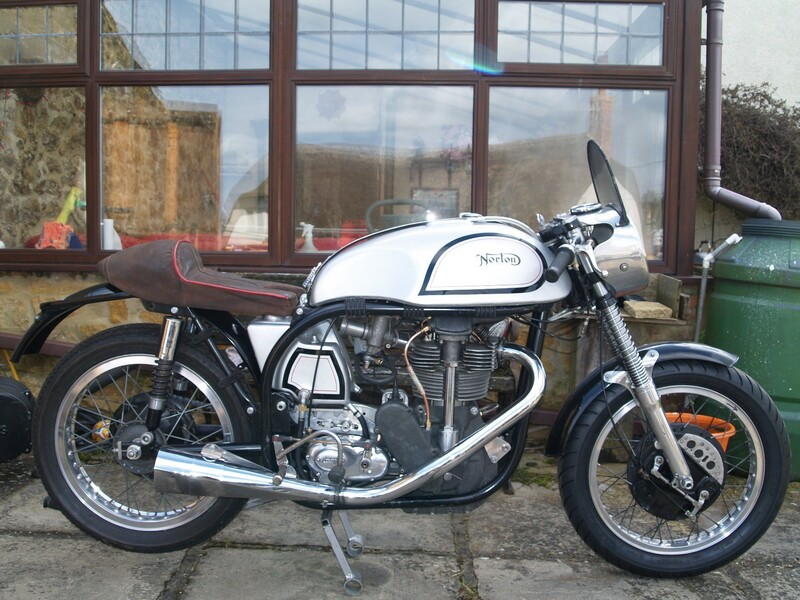 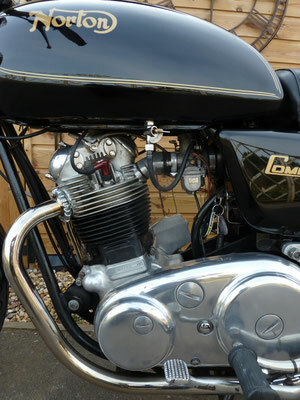 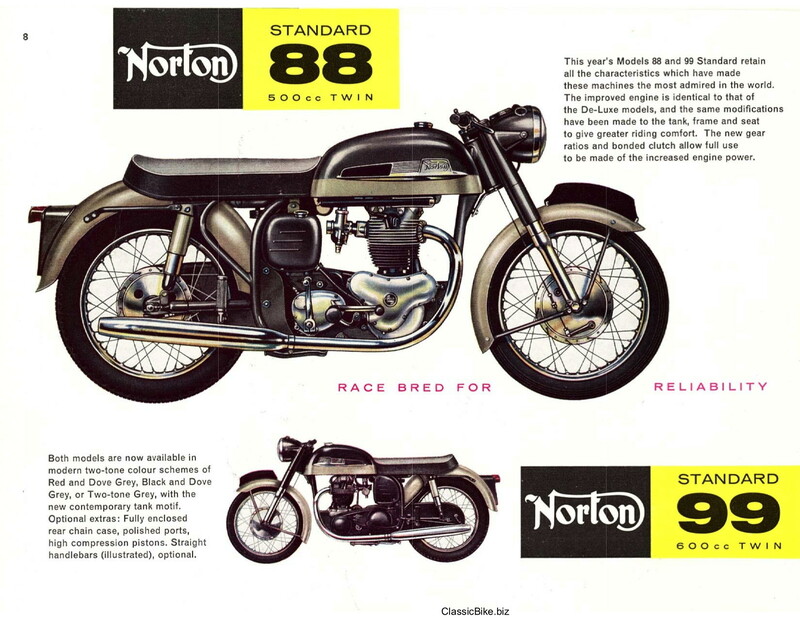 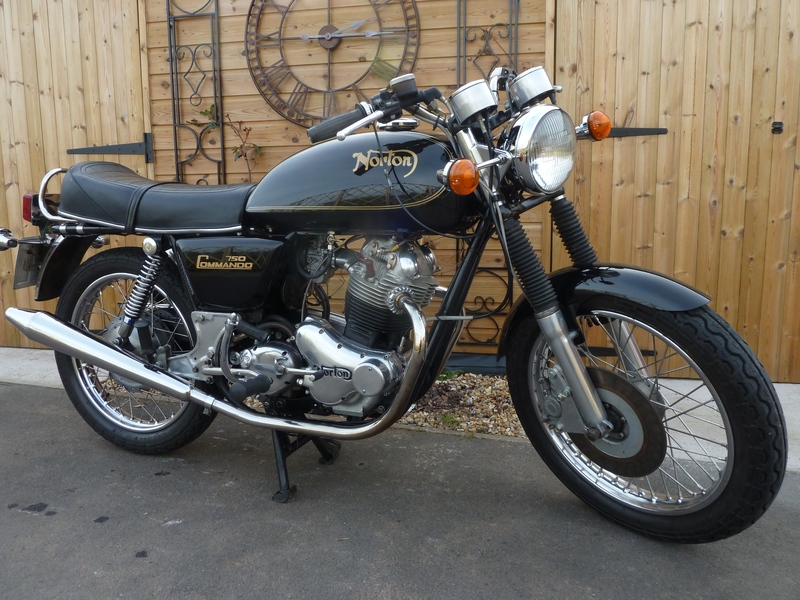 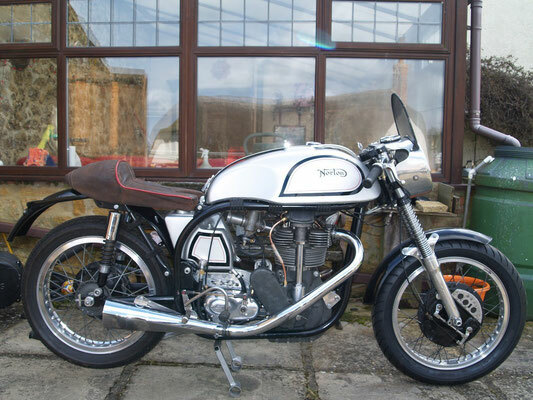 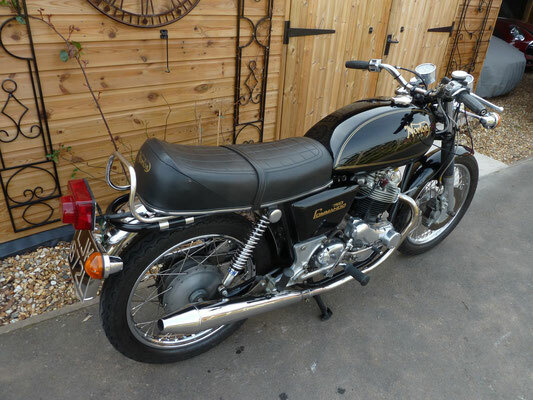 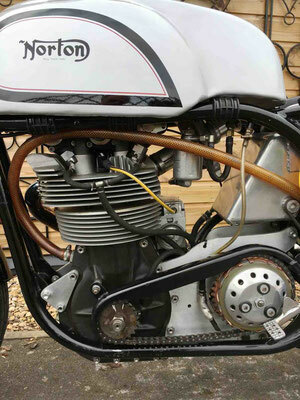 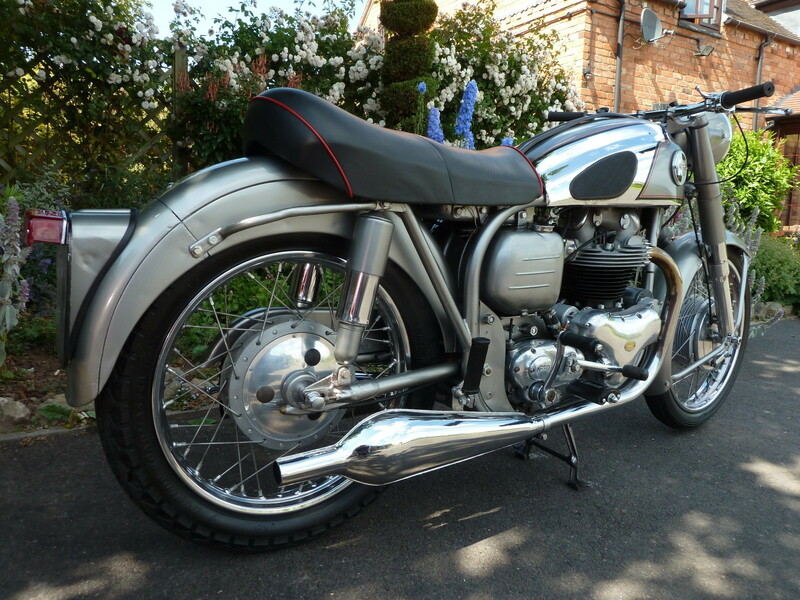 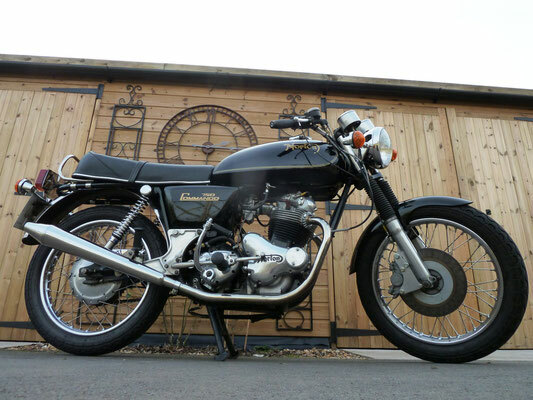 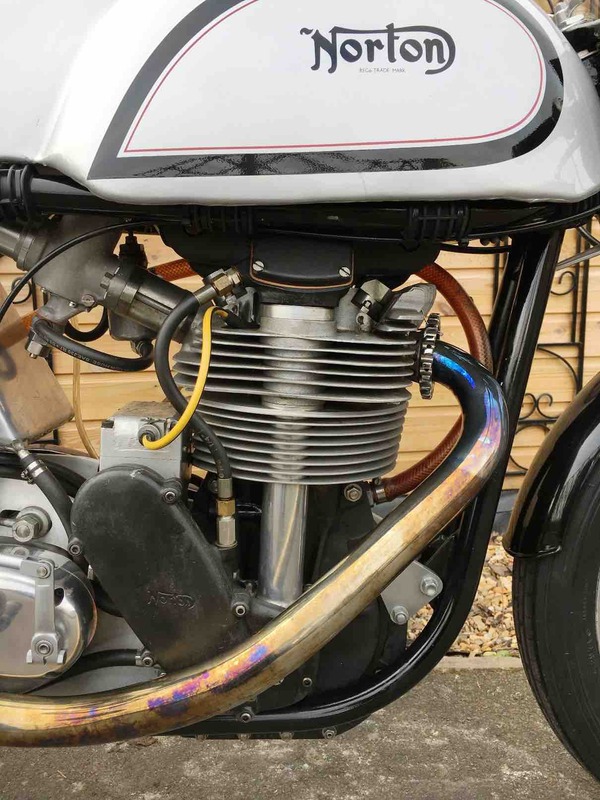 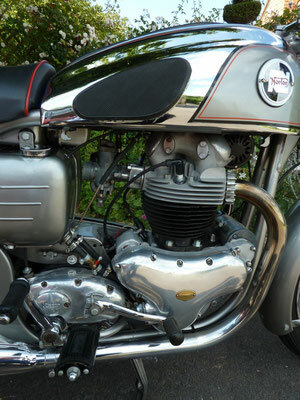 1983 During the 1970s, Norton had inherited a Wankel project via Triumph and BSA. 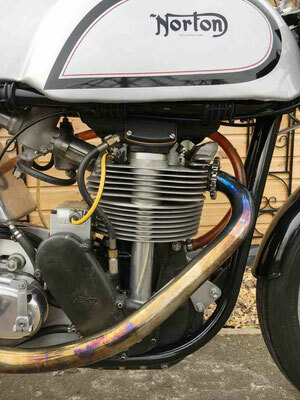 In the early 1980s the police tested this rotary engine, with the second version appearing in 1983. 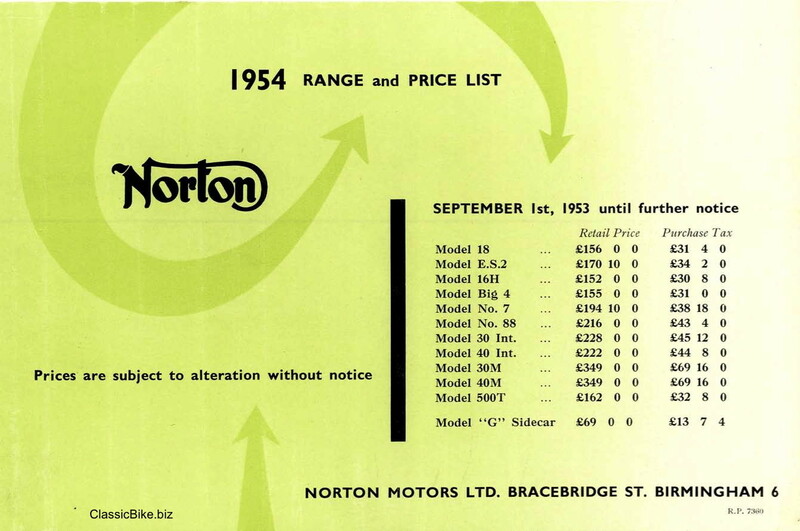 1993 The UK recession and some dubious financial deals brought financial disaster, so production stopped again. 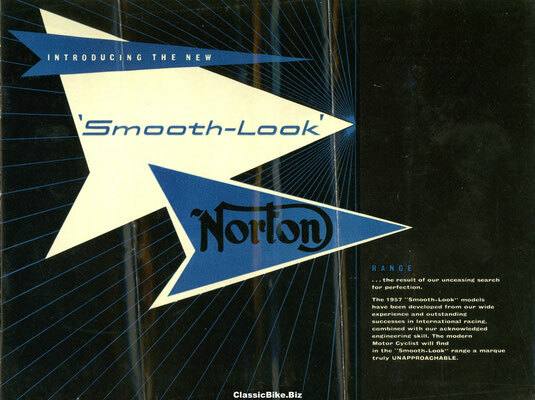 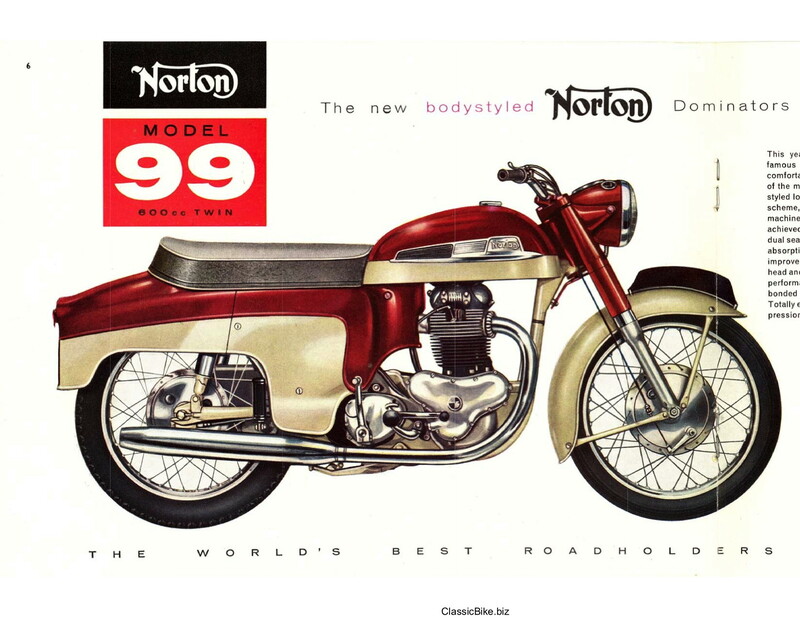 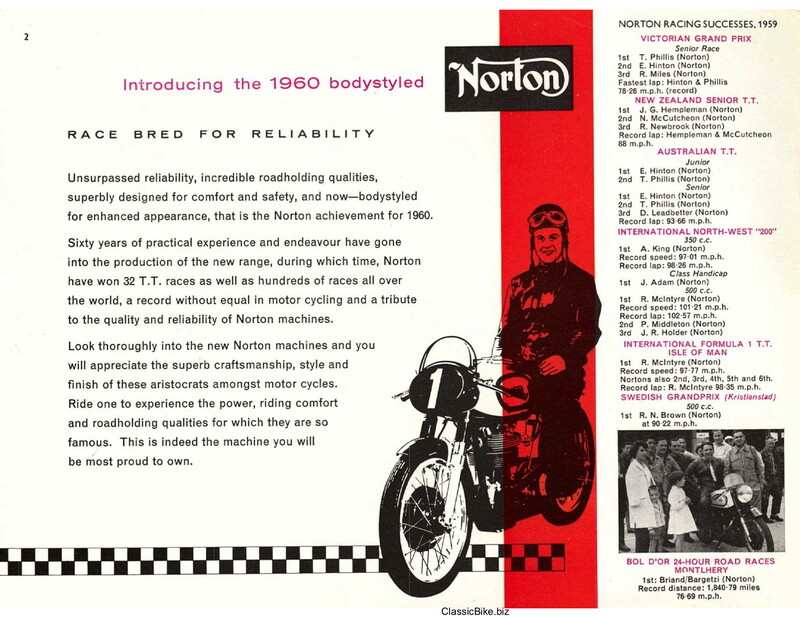 1997 The name or Norton lived on with the production of a machine using a BMW engine (actually a Rotax engine made by Bombardier-Rotax GmbH of Austria). 1998 A link was formed with March and their range carried the Norton badge. 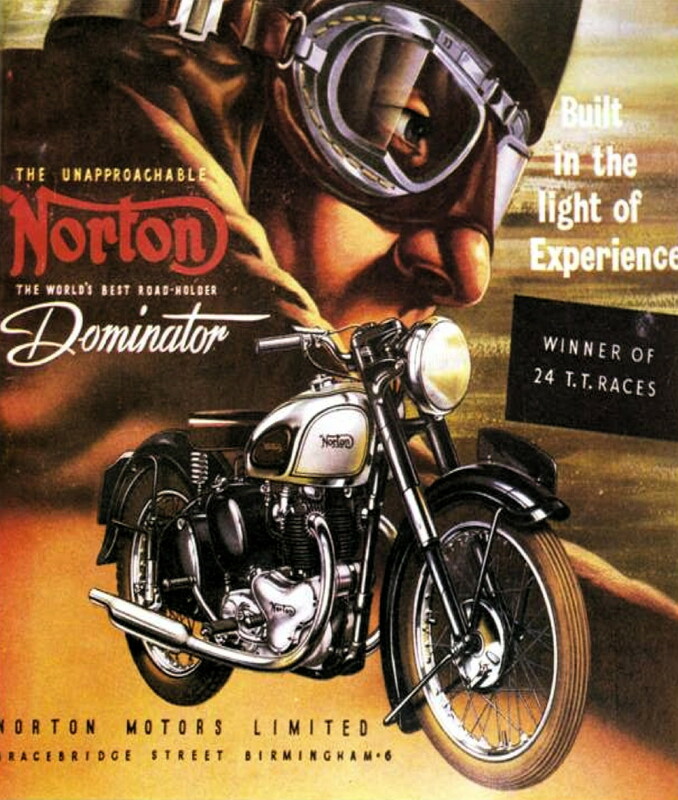 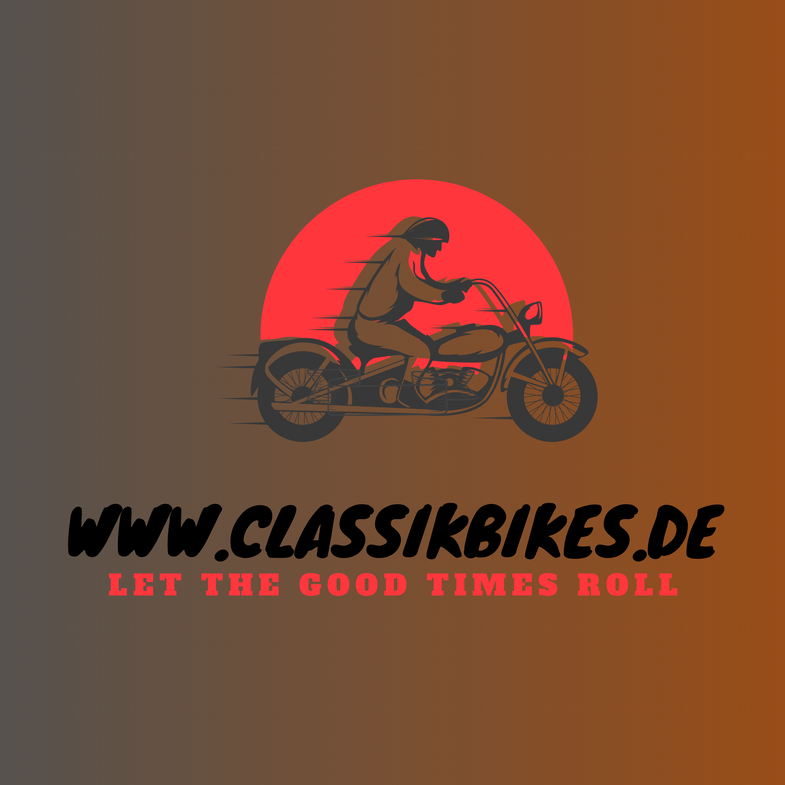 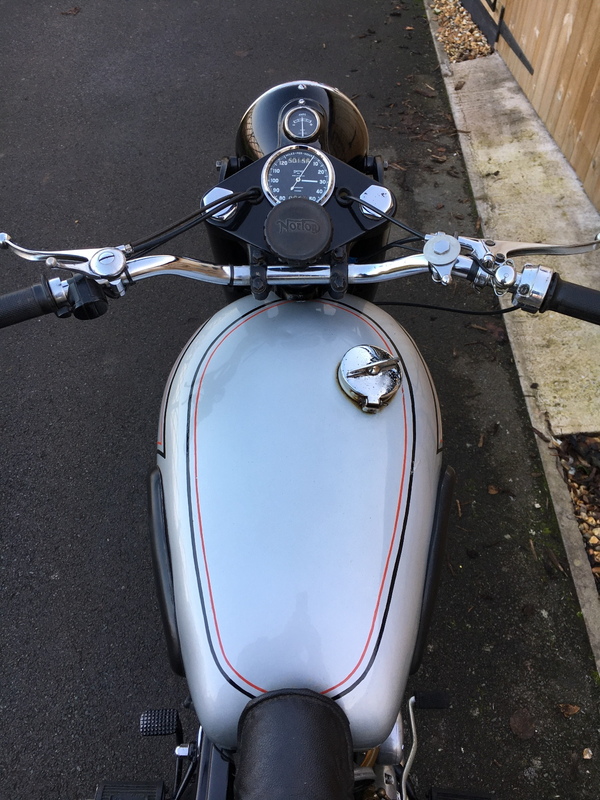 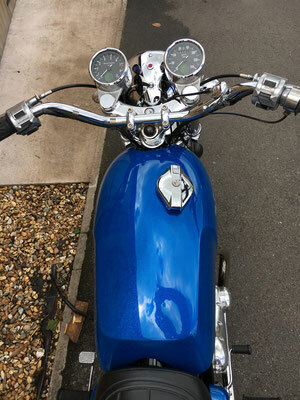 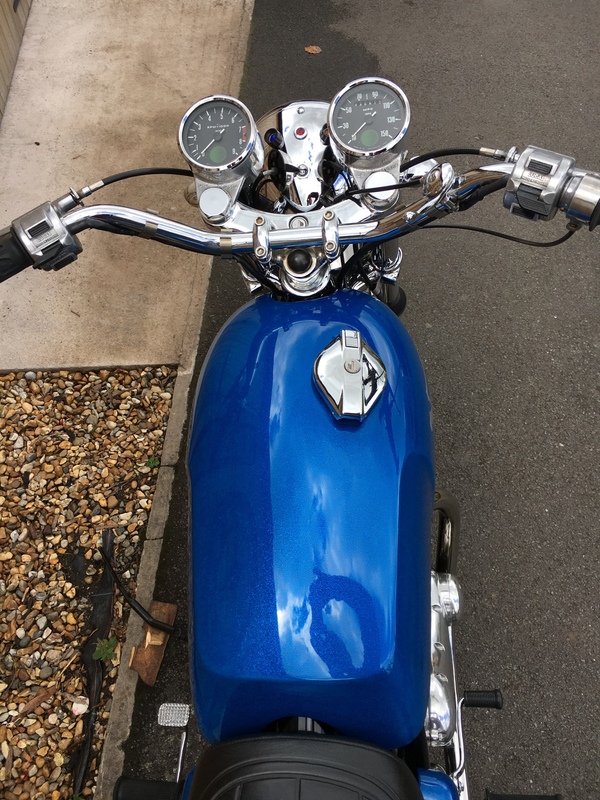 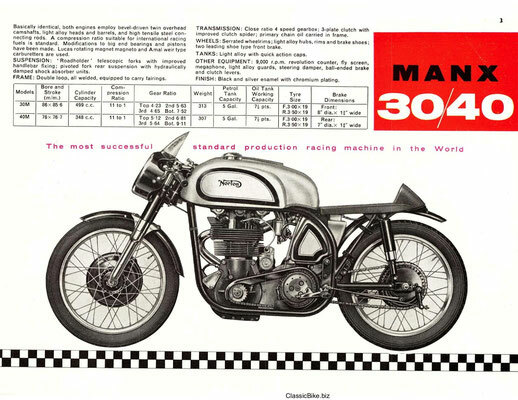 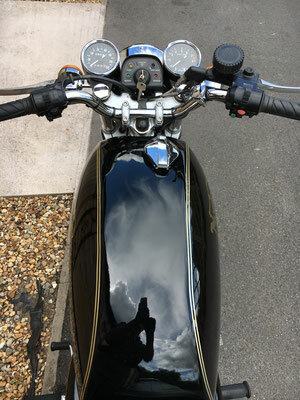 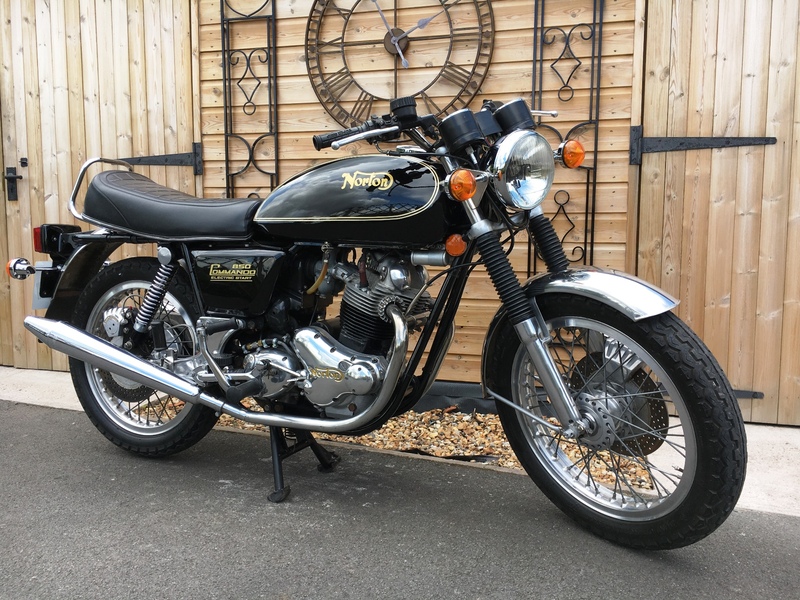 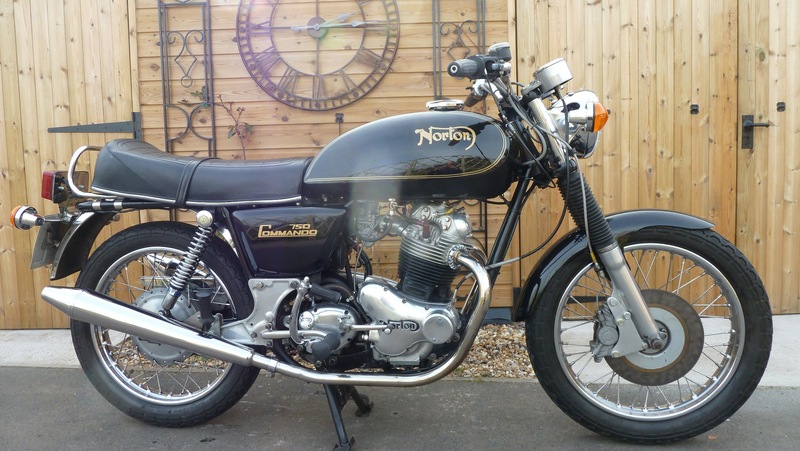 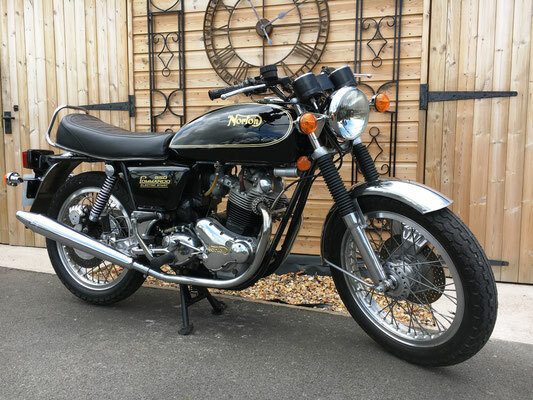 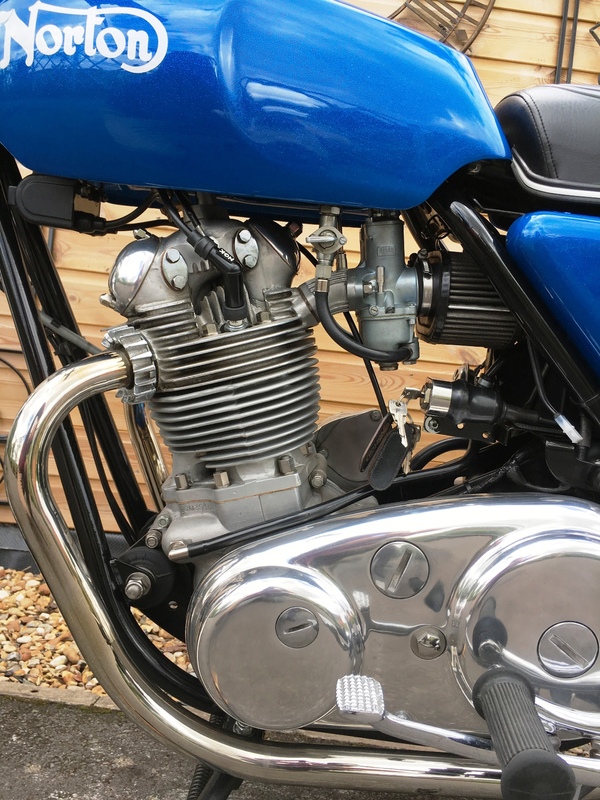 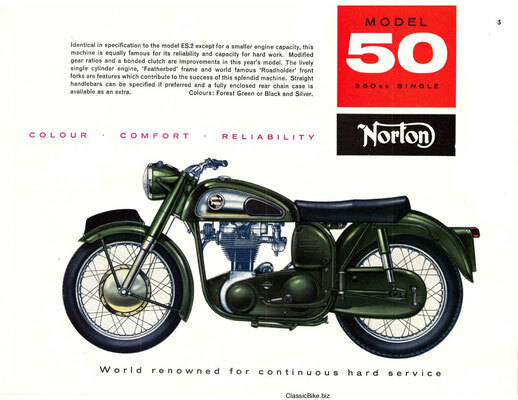 1999 The appearance of a machine built to the design of Kenny Dreer of Vintage Rebuilds in Oregon, which retained the classic Norton lines by restoring and upgrading Commandos to produce whole machines. 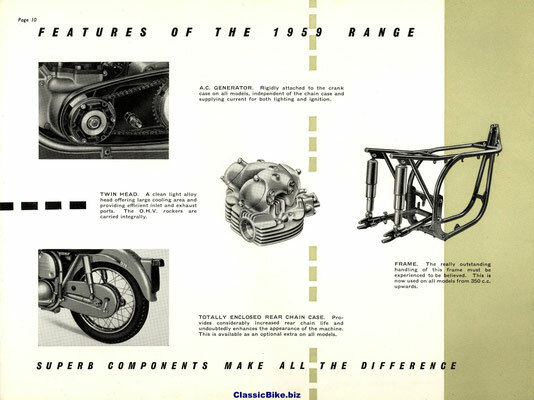 He modernised the design and went into series production. 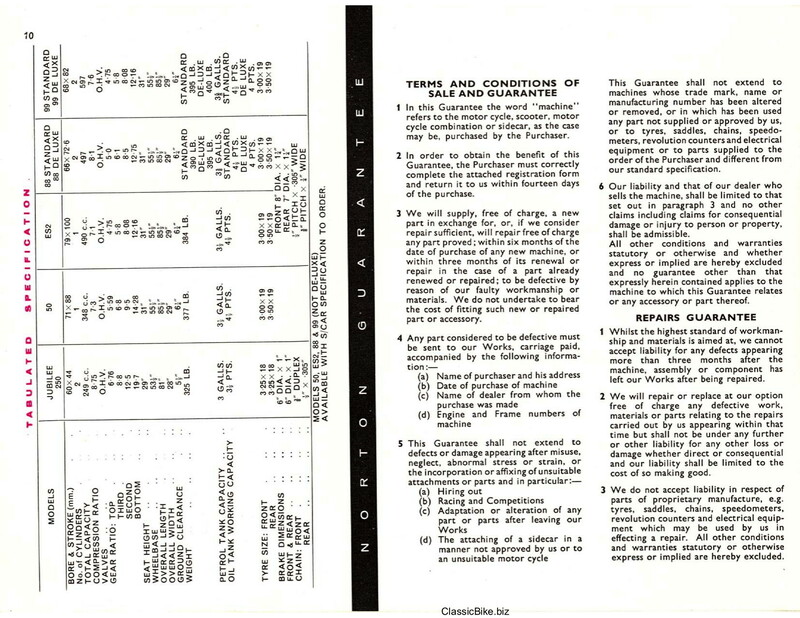 2006 In April of that year Kenny Dreer suspended operations.